«Να κι οι Μανιάτες! Κι είν’ όπως είναι οι βράχοι τους: και σουβλεροί κι ολόρθοι, και ολόγυμνοι και απάτητοι και ξεμοναχιασμένοι». Κωστής Παλαμάς. The Mani Peninsula (Μάνη), is a geographical and cultural region in Greece that is home to the Maniots (Mανιάτες). The capital city of Mani is Areopoli. Mani is the central peninsula of the three which extend southwards from the Peloponnese in southern Greece. To the east is the Laconian Gulf, to the west the Messenian Gulf. 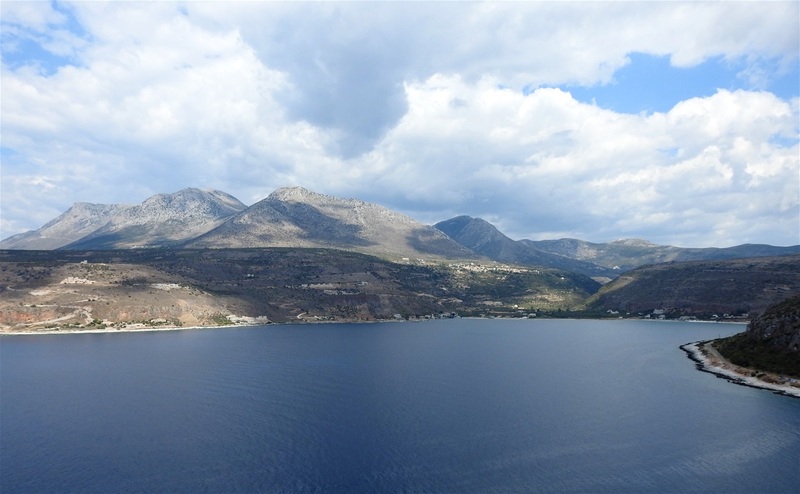 The peninsula forms a continuation of the Taygetos mountain range, the western spine of the Peloponnese. 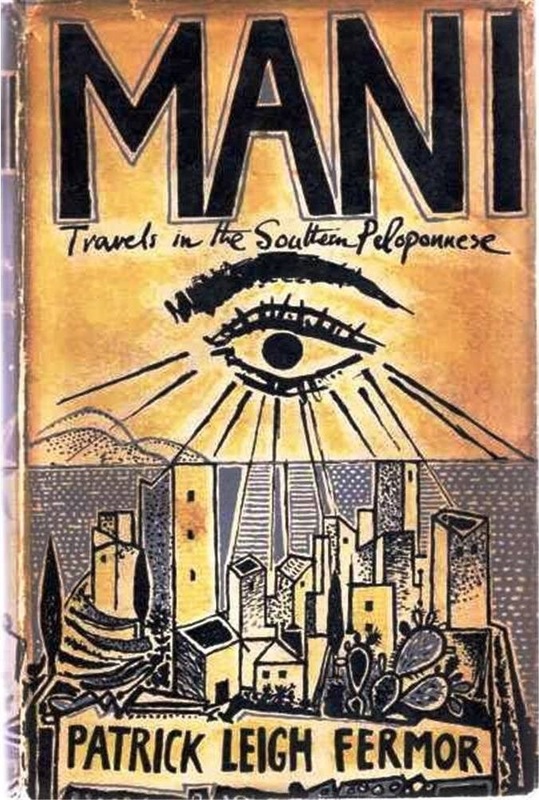 The name "Mani" may come from the name of the Frankish castle “le Grand Magne” (the location of which is not clear). Mani on the map (courtesy of google maps). Until recent years many villages could be reached only by sea. Today, mainly thanks to tourism, a winding road extends along the west coast from Kalamata to Areopoli, then south to Cape Tenaro (the pointed cape, which is the southernmost point of continental Greece), before it turns north toward Gytheio, in the heart of Laconian Gulf. Another road, which is the road for those coming from Athens, comes from Tripoli through Sparta, bypasses Gytheio and ends at Areopoli. There is another road (narrow and winding) that crosses the peninsula from west to east, connecting Areopoli to Kotronas. 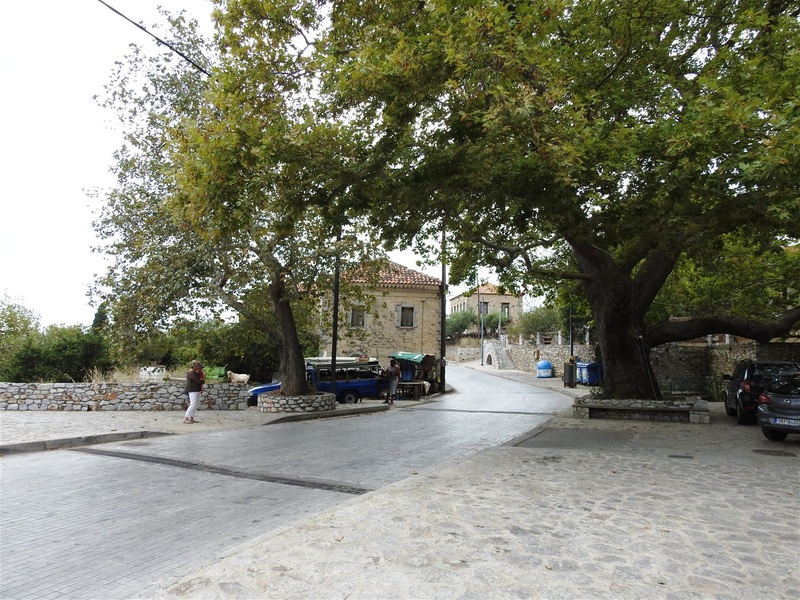 Of course, today, there are several smaller roads that actually connect every village and settlement of Mani. Mani has been traditionally divided into three regions: Exo Mani (Έξω Μάνη) or Outer Mani to the northwest, Kato Mani (Κάτω Μάνη) or Lower Mani to the east, and Mesa Mani (Μέσα Μάνη) or Inner Mani to the southwest. 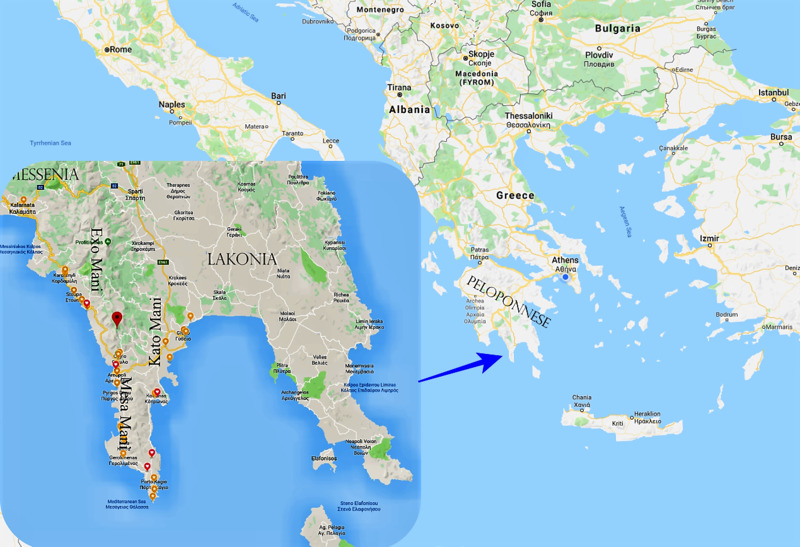 Administratively, Mani is now divided between the prefectures of Laconia (Kato Mani, Mesa Mani) and Messenia (Exo Mani), in the periphery of Peloponnesos, but in ancient times it lay entirely within Laconia, the district dominated by Sparta. The Messenian Mani (also called aposkiaderi, a local expression meaning "shady") receives somewhat more rainfall than the Laconian (called prosiliaki, a local expression meaning "sunny"), and is consequently more productive in agriculture. Maniots from what is now Messenian Mani have surnames that uniformly end in -éas, whereas Maniots from what is now Laconian Mani have surnames that end in -ákos; additionally, there is the -óggonas ending, a corruption of éggonos, "grandson". 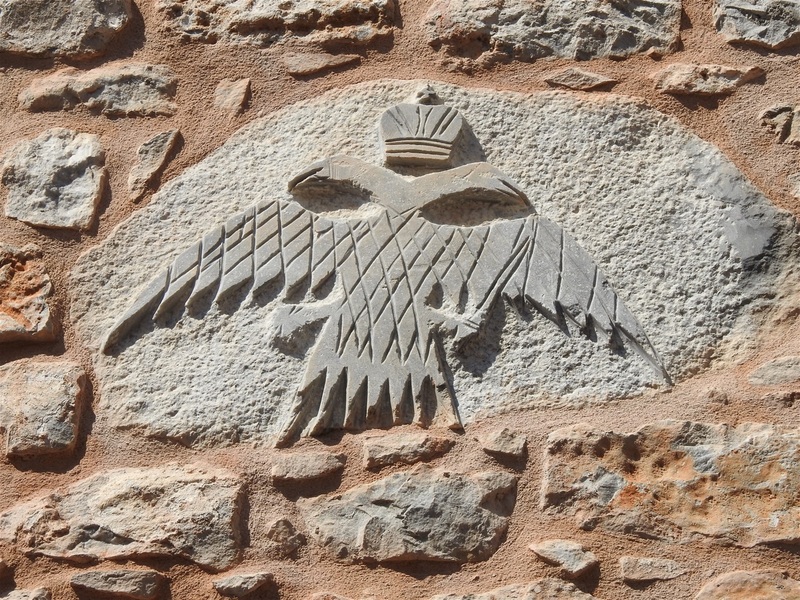 The Byzantine two-headed eagle carved at the facade of a house in Areopoli. Areopoli, the “capital city” of Mani, is 280km from Athens, which means that one has to drive for about 3 hours and 30 minutes. Areopoli is a good base if you want to explore the area, as from there the longest distance you have to drive is 40km to Cape Tenaro. Kalamata (the capital city of Messenia Prefecture) is only 80km from Areopoli, but it takes almost 2 hours to drive the coastal road. Sparta, the capital of the Laconia Prefecture is 60 km to the north and only one-hour drive away from Aeropoli. 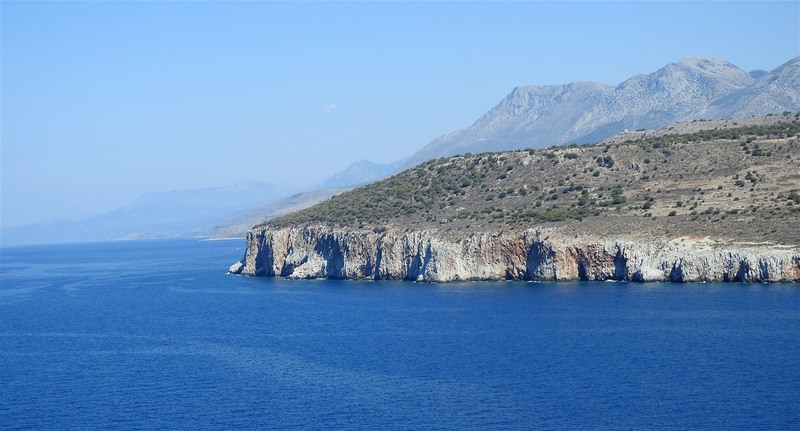 Sea and rock: the rough but enchanting landscape of Mani. As the power of the Byzantine Empire declined, the peninsula drifted out of the Empire's control. Over the subsequent centuries, the peninsula was fought over by the Byzantines, the Franks (This term is used by Greeks to collectively describe western Europeans. The term appeared during the Crusades and continued to be used till the 19th cent. In several occasions, it is used even today) and the Saracens. In 1460, after the fall of Constantinople, the Despotate fell to the Ottomans. Mani was not subdued and retained its internal self-government in exchange for an annual tribute, although this was only paid once. Local chieftains or “beys” governed Mani on behalf of the Ottomans: The first of these rulers, Liberakis Yerakaris, reigned in the middle of the seventeenth century. During the forty-five years from 1776 to 1821, when the War of Independence broke out, the Mani was ruled by eight successive Beys, all except one of whom played the dangerous game of maintaining the interests of the Mani and of eventual Greek freedom while trying to remain on the right side of the Turks. The English poet, writer, and libertine Lord Byron put all his wealth and ultimately his life into the War for Greek independence. As Ottoman power declined, the mountains of the Mani became a stronghold of the klephts (follow the link to my page to read more about klephts: Klefts), bandits who also fought against the Ottomans. There is also evidence of a sizeable Maniot emigration to Corsica sometime during the Ottoman years. Petros Mavromichalis, the last bey of Mani, was among the leaders of the Greek War of Indepedence. He proclaimed the revolution at Areopoli on March 17, 1821. The Maniots contributed greatly to the struggle, but once Greek independence was won, they wanted to retain local autonomy. During the reign of Ioannis Kapodistrias, they violently resisted outside interference, to the extent of members of the Mavromichalis family killing Kapodistrias. Petrobey Mavromichalis himself has refused any involvement in the assassination. 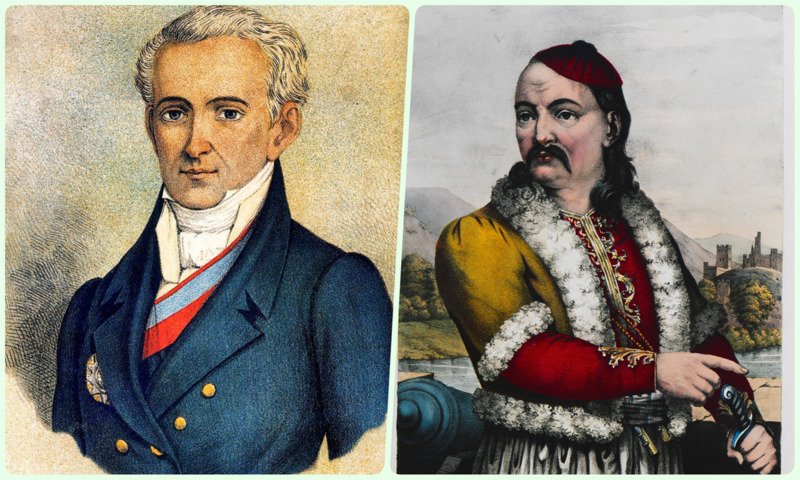 Ioannis Kapodistrias (left) and Petros Mavromichalis-Petrobey (right). In 1878 the national government reduced the local autonomy of the Mani, and the area gradually became a backwater; inhabitants abandoned the land through emigration, with many going to major Greek cities, as well as to Europe and the United States. It was not until the 1970s, when the construction of new roads supported the growth of the tourist industry, that the Mani began to regain population and become prosperous. The last three decades, the area is very popular with tourists from Europe, mainly Germans and French, but thankfully massive tourism has not affected the place and did not spoil its “wild beauty”. 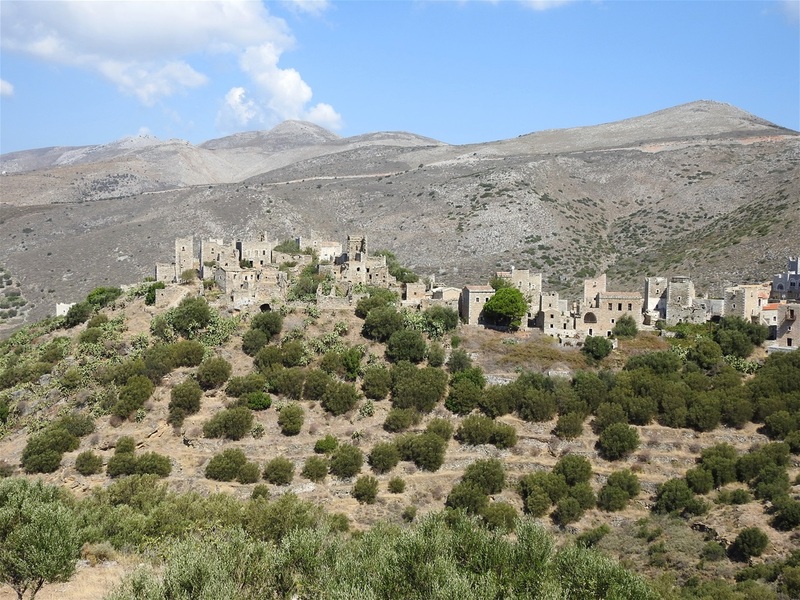 The ancient towerhouses of Mani (pyrgospita) are significant tourist attractions, and some offer accommodations for visitors. 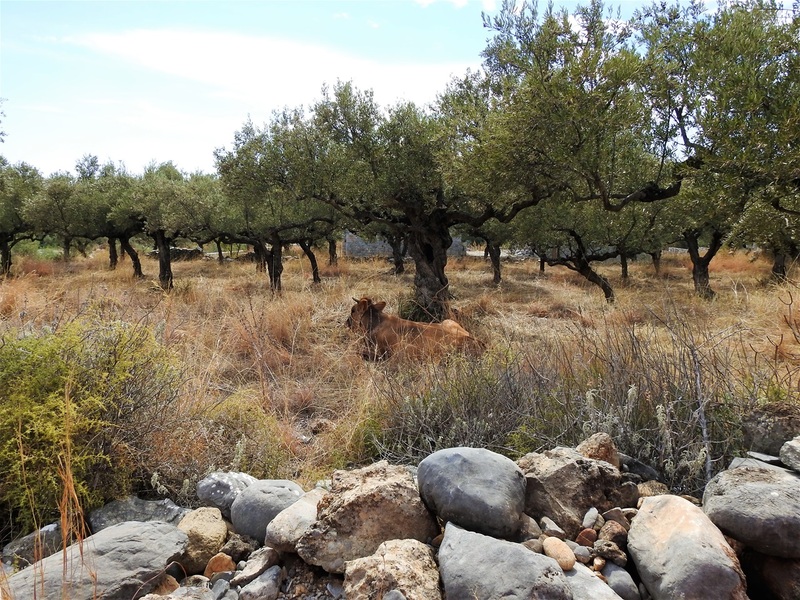 Mani is also known for what is considered by many the world's best extra-virgin olive oil, soft-pressed from partially ripened olives of the Koroneiki variety, which are grown on mountain terraces. From Oitilo to Areopoli (red line). Various color lines show detours to places of interest. 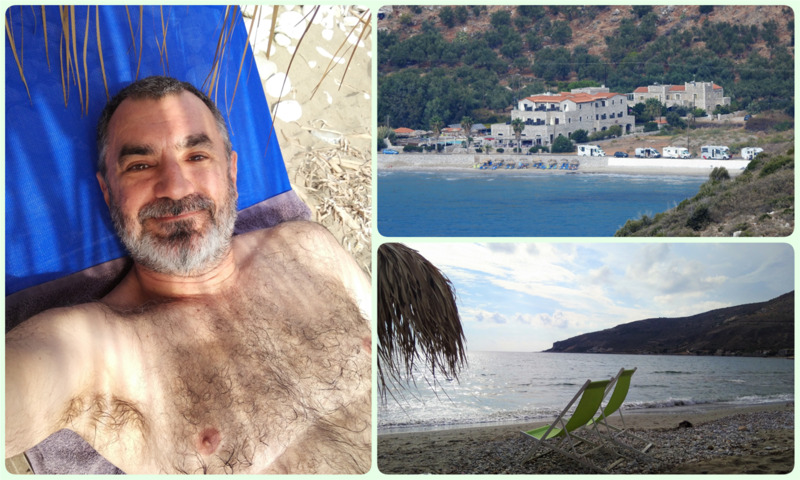 During my 5 days stay in Mani, I decided to reside at “Itilo Hotel” located by the beach, 7km north of Areopoli in a protected gulf, where the most picturesque village o Mani, Limeni, is also located. The place is ideal for beach holidays (not my type of holidays, though), but also very convenient to explore the area. Hotel Itilo is a lovely hotel with beautiful rooms with sea and mountain view. The sandy beach in front of it is just perfect. There is a restaurant on-site with good local food. Neo Oitylo village seen from my room at Itilo Hotel. 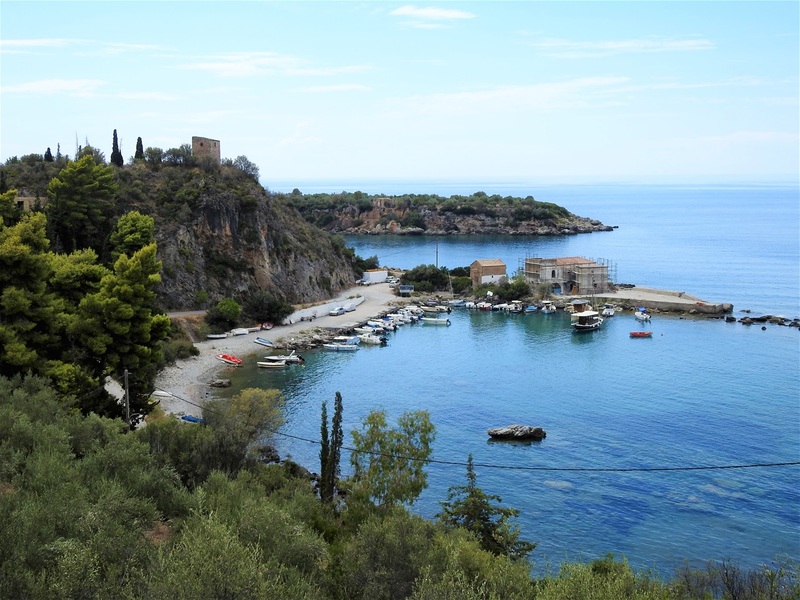 The hotel is located just outside Neo Oitylo (Νέο Οίτυλο) village, which is a little seaside settlement with several cafés and restaurants by the sea. 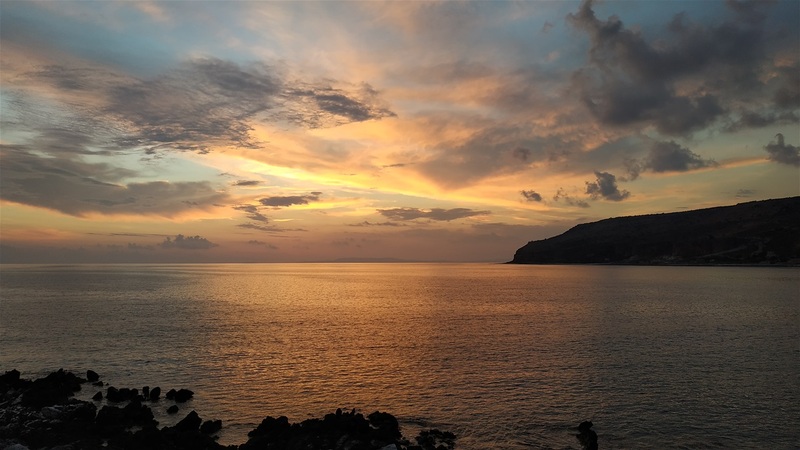 There is no real tourist interest for Neo Oitylo, but the sunset from here is just majestic, as the sun during the summer months goes down into the sea between the two rocky edges of the gulf. 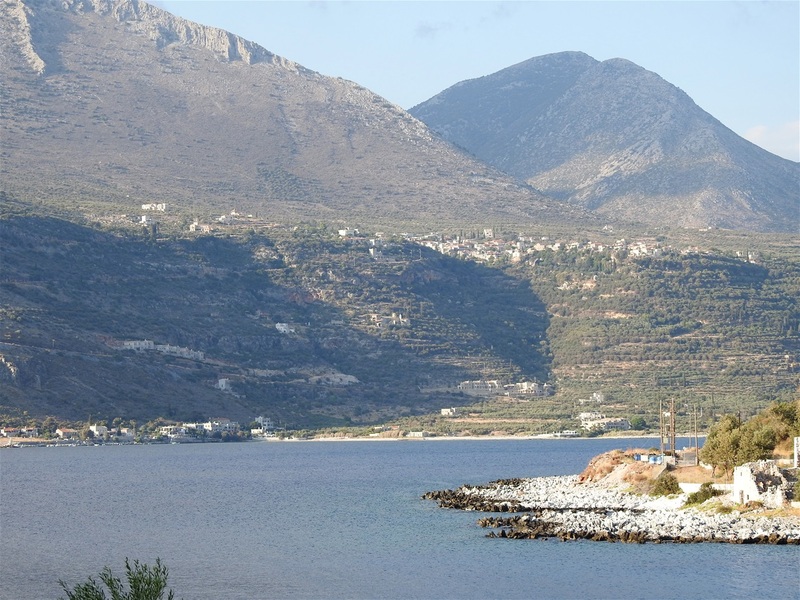 Not far away from Neo Oitylo, Oitylo (Οίτυλο), one of the oldest towns in the Mani Peninsula, attractes the visitor. It is built amphitheatrically, at an altitude of 256 m, only 4 km from the sea. It was mentioned in the Iliad by Homer as Oetylοs (Οίτυλος), as part of Menelaus' kingdom. The town participated in the Trojan War by offering ships. According to the legend, Oitylo was one of the cities that Agamemnon offered as a gift to Achilles in return for his participation in the Troyan campaign. Oitylo seen from Neo Oitylo. 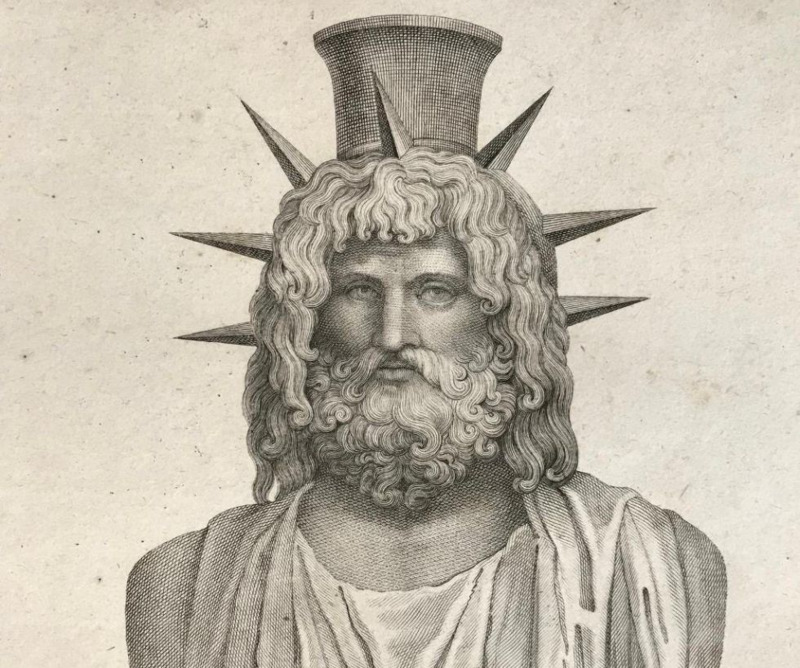 The famous Greek traveler, Pausanias, says that in the town there was a sanctuary of the Greek-Egyptian God Serapis (Σέραπις) and in the market a sculpture of the Carneus Apollo (a famous in Sparta form of Apollo). He also states that Oitylo was a colony of Leuktra (in Boeotia), colonized by King Itylo or Vitylo, from whom it took its name. According to another version, Oitylo got its name from the mythical hero Otillo from Argos. 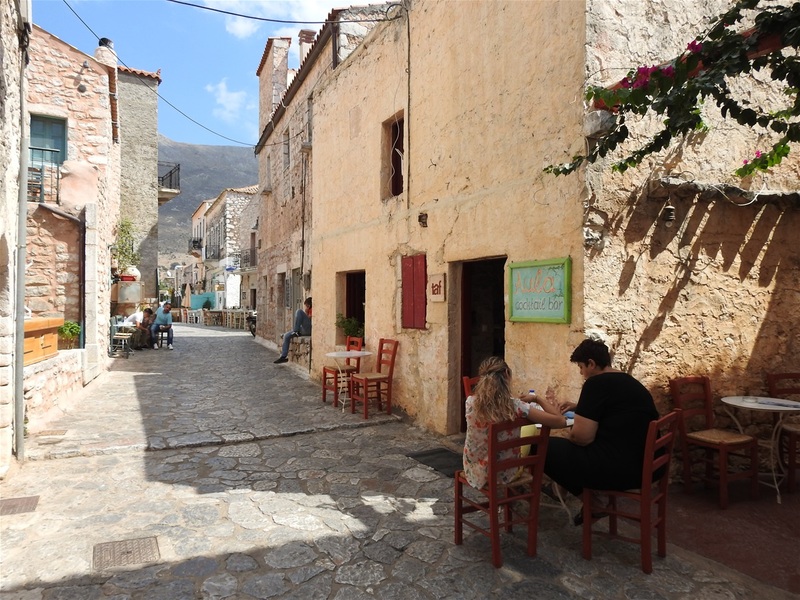 In the Middle Ages, Oitylo grew to become the most important town in Messenian Mani. 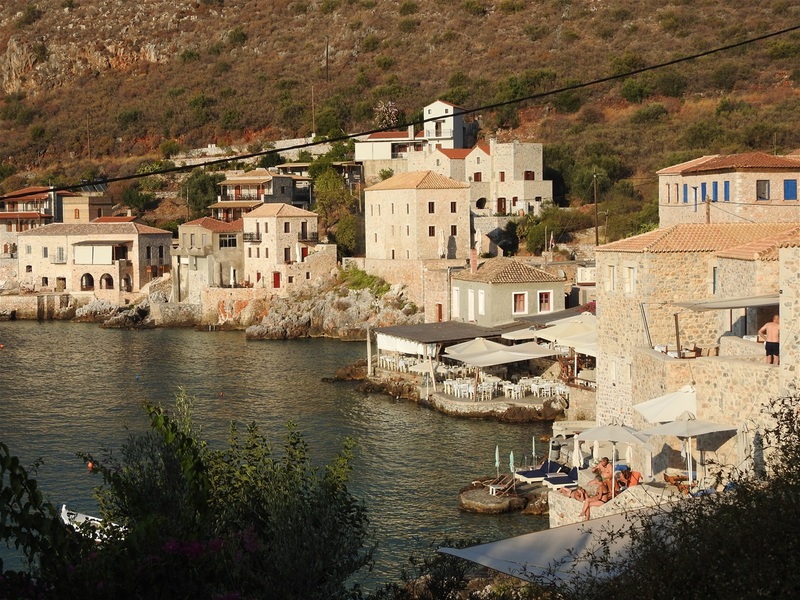 The only town in Mani that rivaled Oitylos in numbers of pirates was Skoutari. 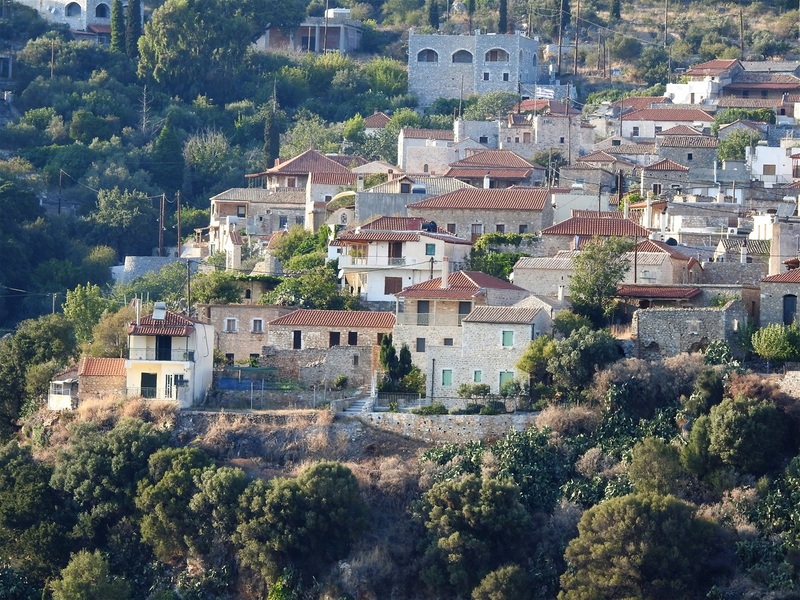 Now Areopoli has taken Oitylo's place as most important town in Laconian Mani. The town is also mentioned by the ancient Greek traveler Pausanias. In the period 1670-1675, eminent families of the area, descending from Byzantine Princes, Komnenos/Stephanopoulos and Medici/Gatriani migrated to Genoa and Tuscany respectively. Members of both families settled in Corsica. The town of Oitylo is built at an elevated plateau overlooking the Oitylo bay. Wandering in the traditional village of Oitylo with the stone houses and paved paths the visitor passes through the picturesque square of the village. There is a traditional café here as well as the church of the Dormition of the Virgin. Unfortunately, the town is rather neglected and there is nothing to do around here for entertainment. All tourist activity has been long moved down to the beach. From the location called "Frygano", there is an impressive view both of the Oitylos bay and the Myllagados gorge, which separates Oitylo from the village of Kelefas and its beautiful castle. In Oitilo near the modern building of the primary school, and across from the west entrance of the church of the Taxiarches, it is ruined to this day a huge building used since the days of the establishment of the Greek state, until the middle of the twentieth century for elementary school, so it is called "old school". There is, however, another very strange name that until now historian has not been concerned with the investigation and the local tradition has greatly preserved the name "palace". Oitylo. Typical architecture of Mani. The palace was built between 1407-1415 when Emperor Manuel II Palaiologos appointed as Despot of Mistras the son of Theodoros II and because he is a minor, h sends Manuel Frangopoulos as temporary guardian. Those days, Oitilo was a mighty castle. For centuries, the palace used as house for princes and other noble persons. 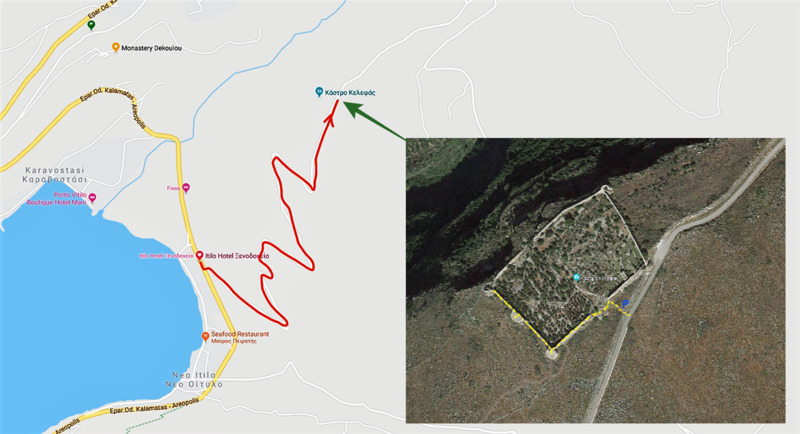 You cannot visit the Kelefas (Κελεφάς) castle from Oitylo directly: one has to go down to the beach and take the main road towards Neo OItylo. On the main road, just after passing the Itilo Hotel, take the road on the left hand and in 5 minutes (~3 km) you park your car in front of what used to be the entrance to the castle. Enter the castle with caution as the vegetation is thick and there are rocks everywhere. 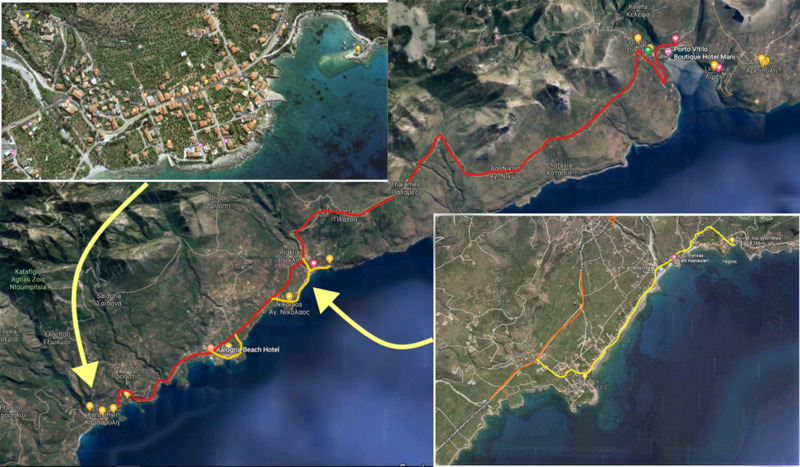 The road to Kelefas castle (red line) and the walk on the castle walls (yellow dotted line). Kelefas castle seen from the road going from Neo Oitylo to Kelefas village. It is relatively easy to climb up the battlements and walk at the top of the walls (on your own risk ). You can reach as far as the northeastern corner of the walls, from where you have great views, not only of the Oitylo bay, but also of the gorge and the town of Oitylo. Me on the battlements of Kelefas castle. Oitylo seen from Kelefas castle. 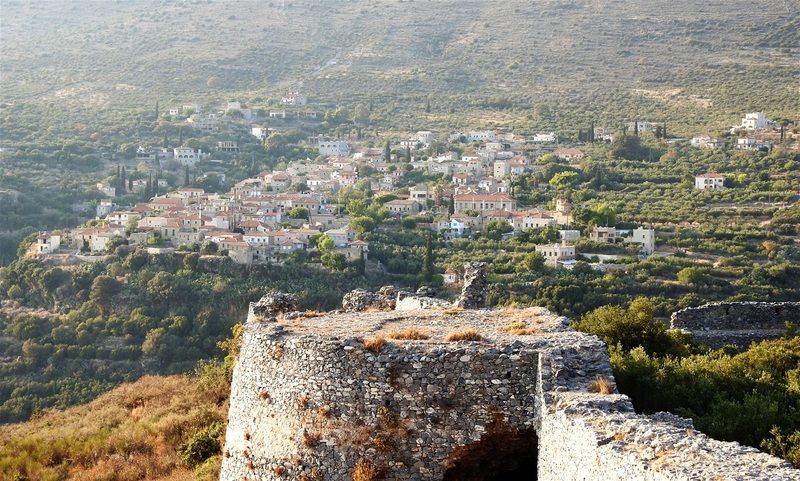 The Kelefas castle was built in 1679 by the Ottomans, in order to contain the Inner Mani region. Some years later, in 1685, the Maniots besieged the castle. They sent messengers to Venice so the Doge could send a fleet to help them capture the castle. The Venetians were currently at war with the Ottomans so they agreed and sent a fleet under Francesco Morosini. As soon the fleets bearing the symbol of St Mark entered the bay, the Ottoman garrison surrendered. A year later the Ottomans returned with a strong force and laid siege to the castle but were driven back. 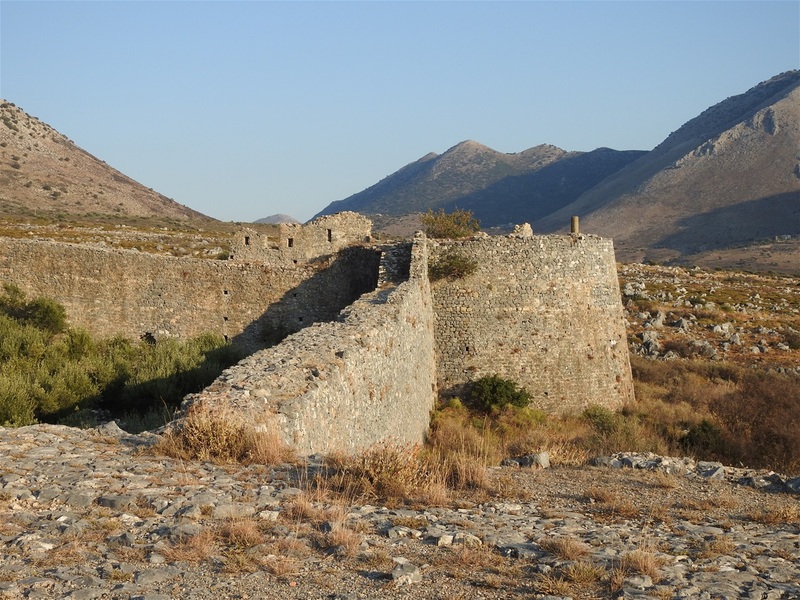 Along with the rest of the Peloponnese, the castle remained in Venetian hands for about 30 years, but in 1715 the Ottomans recaptured the Peloponnese. Around 1780 the Ottomans abandoned the castle, which became derelict. 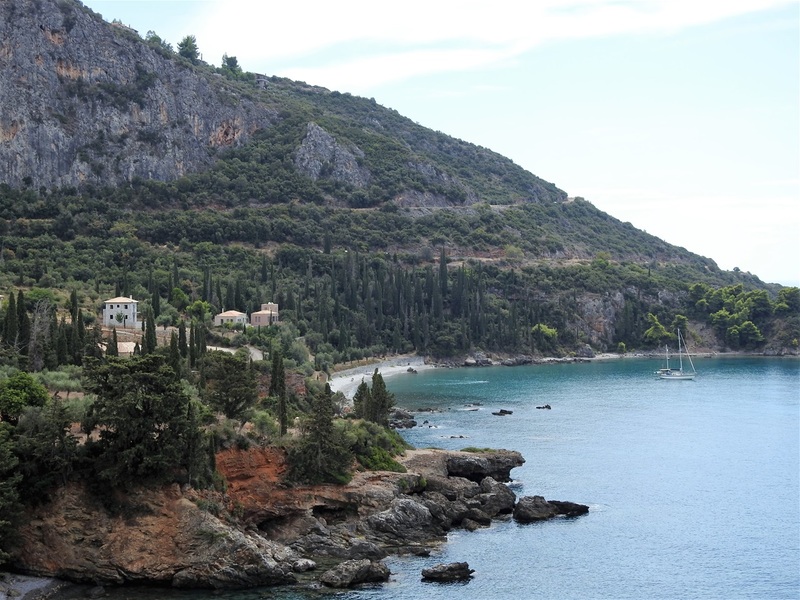 In the location Karidi, on the slope that descends from Oitylo to the sea is located the Dekoulou Monastery. On the road from Neo Oitylo to Oitylo there is a sign to turn right. The monastery is less than one km away from the turn. 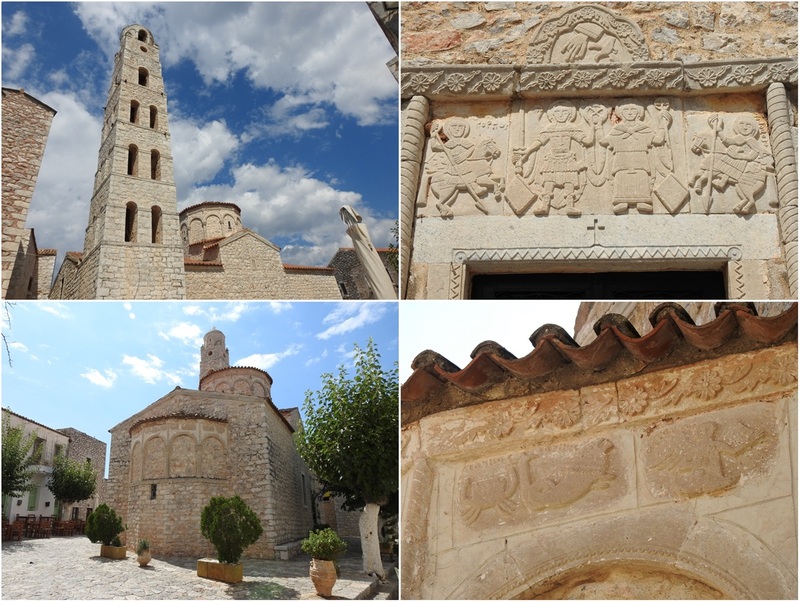 The monastery is triune monastery, dedicated to the Zodochochos Pigi, Agios Panteleimonas and Agios Nikolaos. Follow the red line to reach the Dekoulou Monastery from Neo Oitylo and Aeropoli. 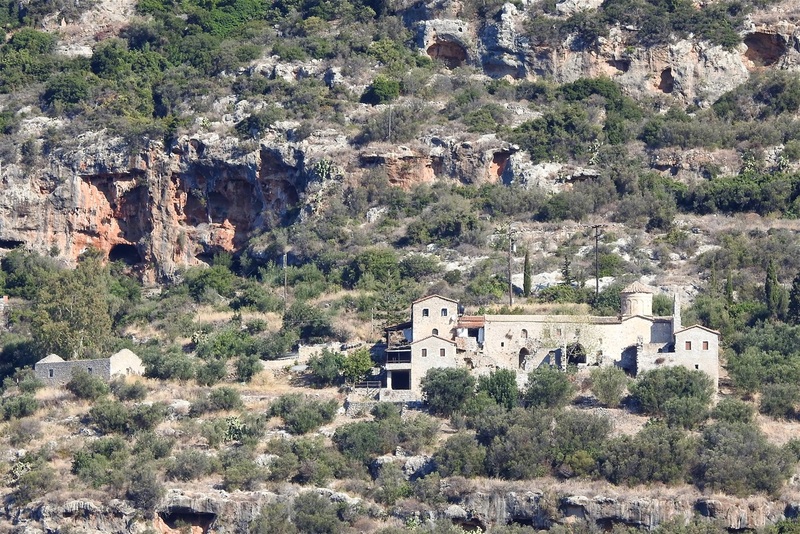 Dekoulou Monastery seen from Neo Oitylo. The monastery founded by the Bishop of Mani Daniil and his brother Nikiforos, who were descendants of the Dekoulos family, a branch of the Hellenized Florentine family of Medici (Giatrani). There is no exact information about the date of the foundation of the Monastery, however, from an inscription we know that it was renovated in 1765. The katholikon of Dekoulou Monastery. 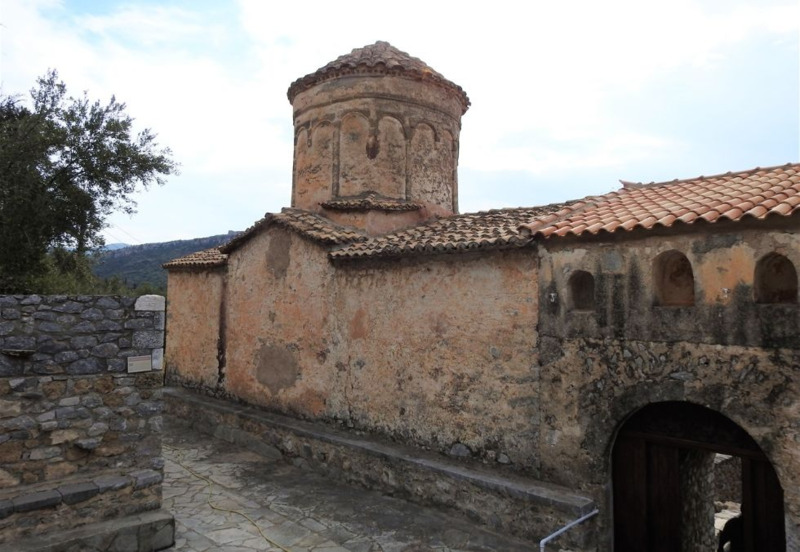 The katholikon (church) of the Dekoulou Monastery is a one-aisled cruciform domed temple. 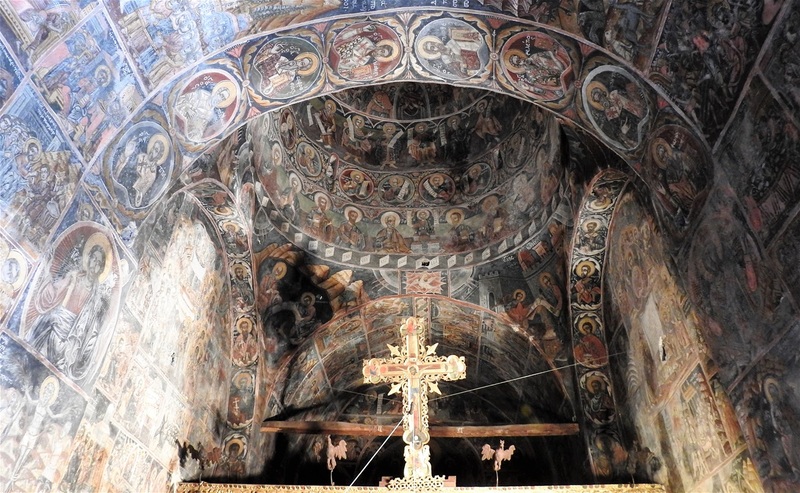 It is adorned with impressive frescoes by Anagnosti Dimagelea, dating back to 1765. At the same time the wooden iconostasis was carved, an exquisite examples of ecclesiastical wood carving, which was especially developed in the Messinian Mani during the late post-Byzantine period and was formed under the influence of the art of Byzantium and the West. 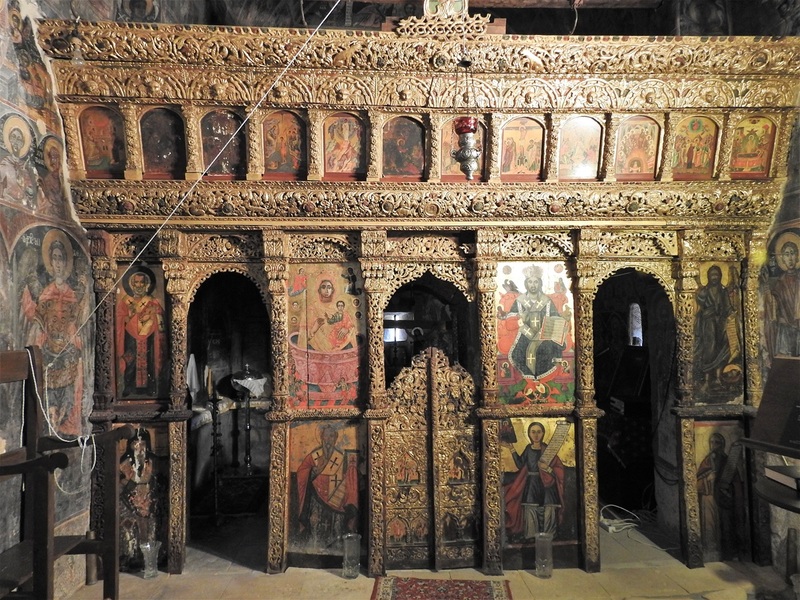 The wooden iconostasis of the katholikon of Dekoulou Monastery. 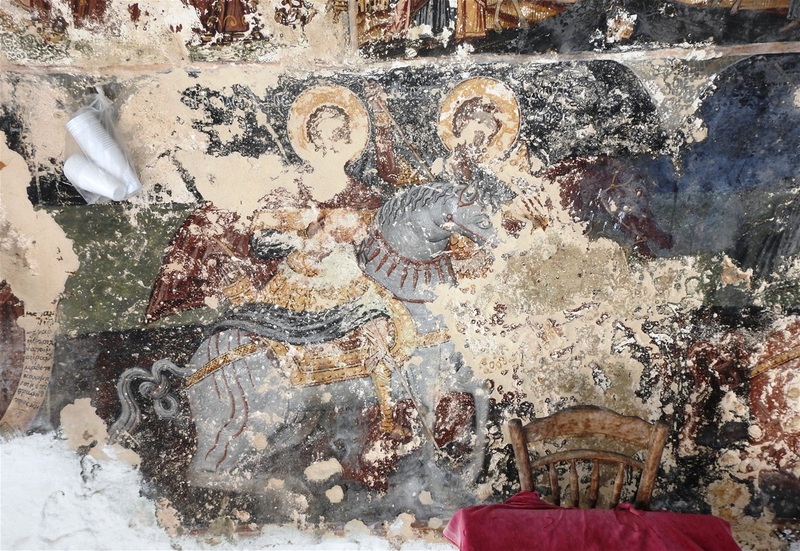 Frescos at the katholikon of Dekoulou Monastery. 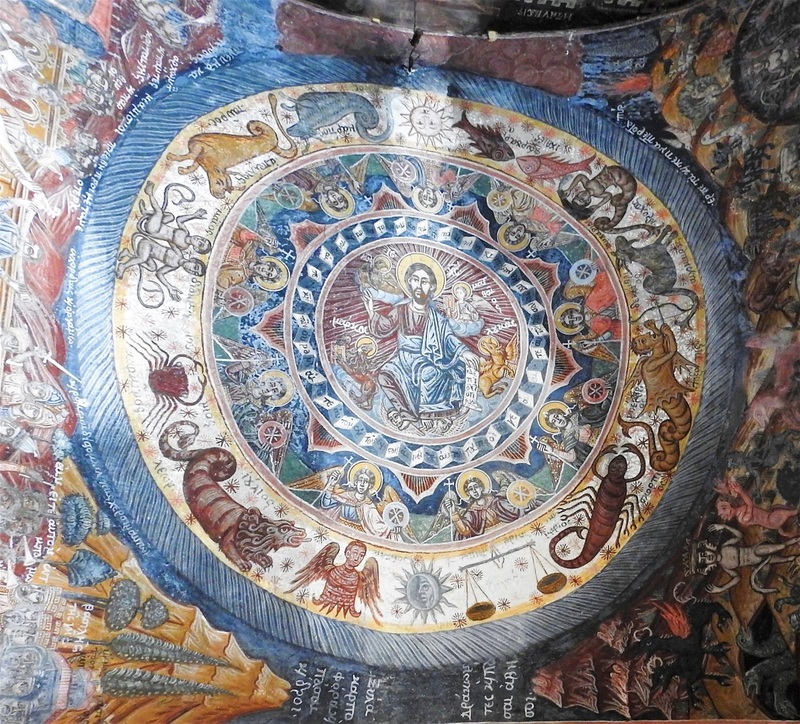 Fresco representing the zodiac circle at the katholikon of Dekoulou Monastery. In 1770, in the area of ​​the Monastery, the historical covenant between the Maniats and the Russian Admiral Orlof was signed with a view to begging the revolution of the Greeks against the Ottoman Empire. The Orlov revolt (Ορλωφικά) was a Greek uprising in the Peloponnese and later also in Crete that broke out in February 1770, following the arrival of Russian Admiral Alexey Orlov, commander of the Imperial Russian Navy during the Russo-Turkish War (1768–1774), to the Mani Peninsula. The revolt, a major precursor to the Greek War of Independence (which erupted in 1821), was part of Catherine the Great's so-called "Greek Plan" and was eventually suppressed by the Ottomans. "The Orlov rebellion … was absurd in conception, devoid of genuine libertarian teleology and brutal and chaotic in execution." – J. C Alexander. 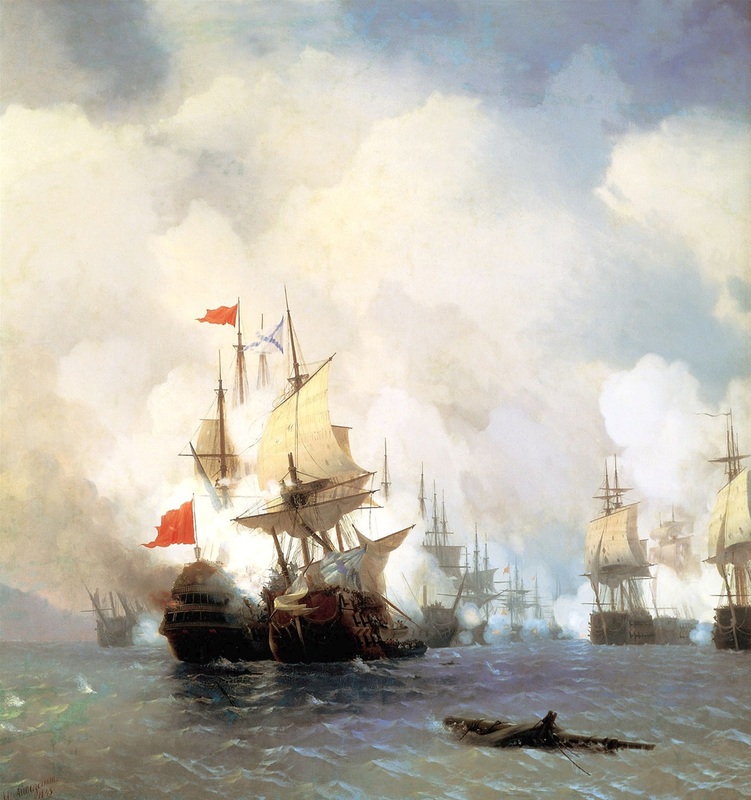 Battle of Chios (1770), by Ivan Aivazovsky (1848). The Russian fleet after prompting the Maniots to raise their war flags, left 50 Russian soldiers to help fight in the ground war, while the fleet sailed on to the Aegean Sea. 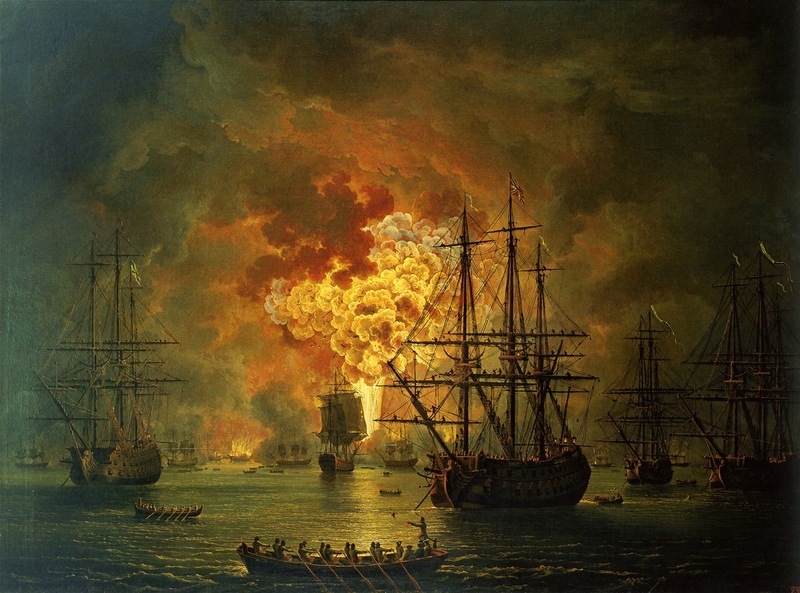 With the assistance of Greek islanders, the Russian fleet was able to score a major victory against the Turkish Navy in the Battle of Chios (Cesme), but this did not help the Greek army in Morea (Peloponnese). As the Russians failed to bring the forces they promised, the revolt was soon crushed. Destruction of the Turkish Fleet in the Bay of Chesma. Jacob Philipp Hackert, 1771. (The Hermitage, St. Petersburg). 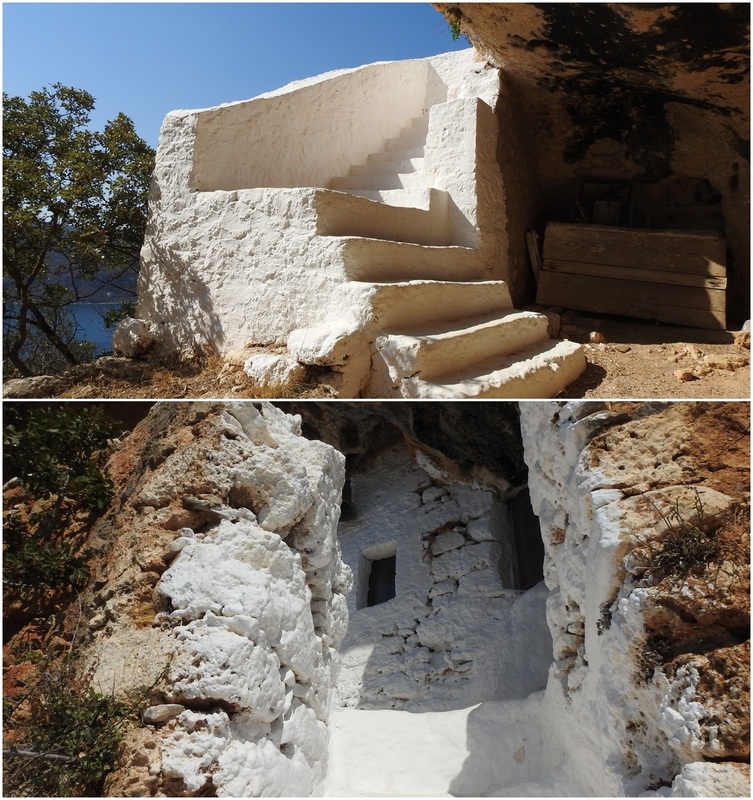 There is a small church built in a cave, on a cliff above the Monastery of Dekoulou, which was a center of worship since ancient times. The church belonged to a the Raselianiko (Ραζελιάνικο) Monastery. It owes its name to the family of Razelos Medikos-Yiatrianos which, after the liberation took the Monastery from the monks, as it belonged to them by inheritance. How to arrive to Panagitsa (red line) from Neo OItylo or Areopoli. 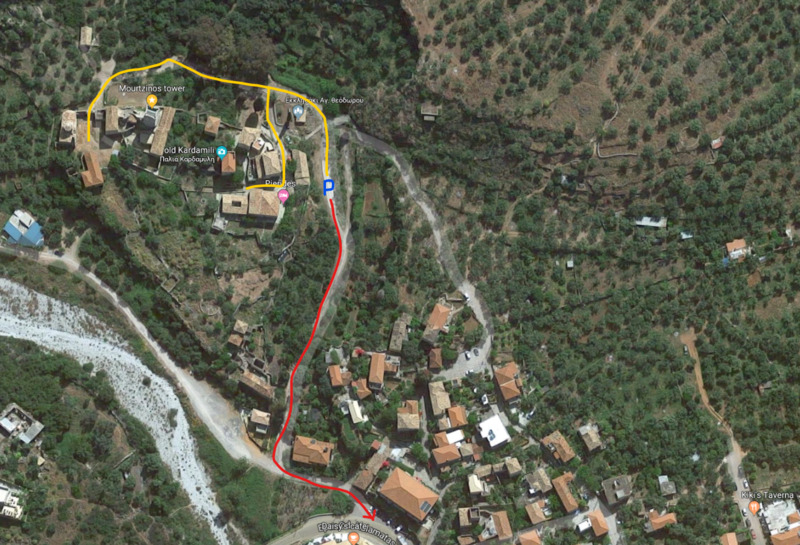 The red line shows the path one has to climb down to reach the little church. The stone inscription and the little church are seen in the pictures. The path leading to the chapel of Raselianiko Monastery (left). The view from the chapel door (right). 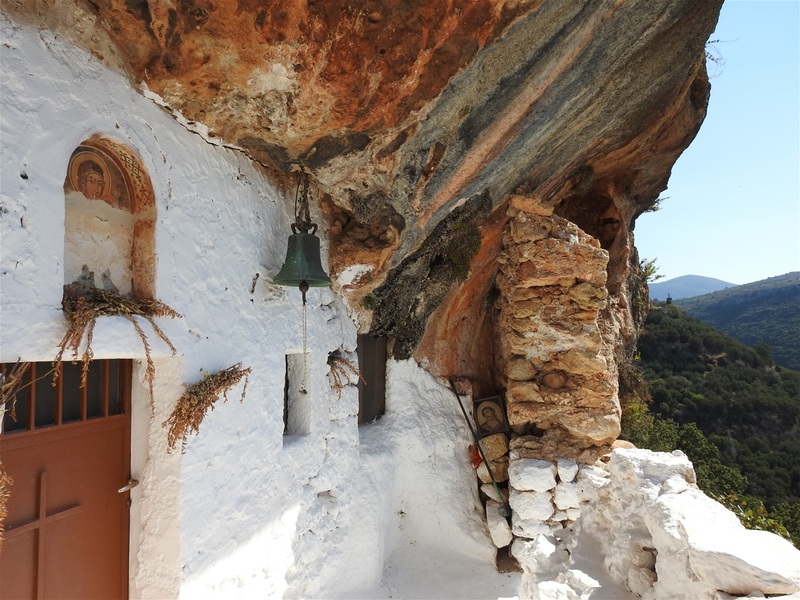 Before that the Monastery was known as Gitraniko Monastery or Panagia Giatrissa (Virgin Mary the Healer). Today, only the katholikon (church) of the monastery exists, the church of Panagitsa Spileiotissa (Virging Mary of the Caves). To the locals the little church is simply known as Panagitsa (little Virgin Mary church). 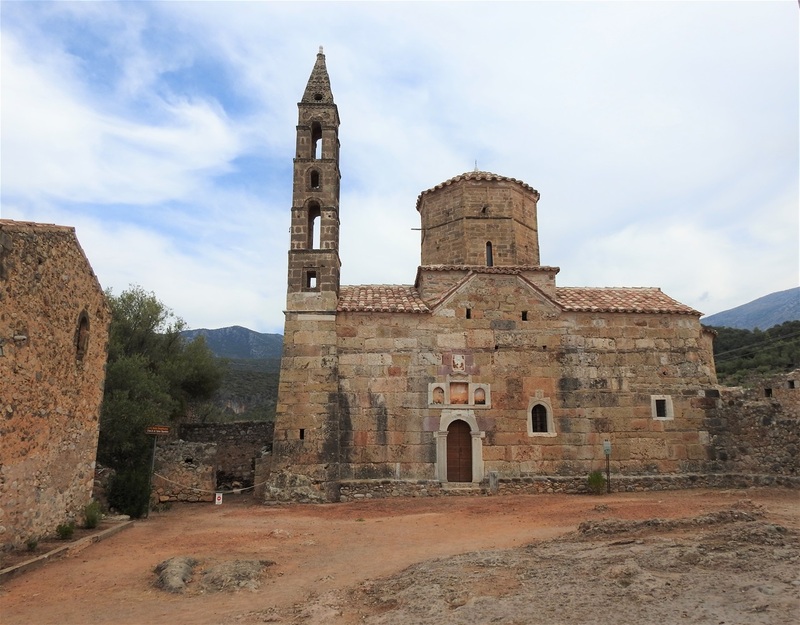 Accorfing to the tradition, the church was built by the Byzantine Emperor Alexius Komninos (1081-1118), who embraced the monastic life and became a saint and patron of Oitylo (known as Voitylo those days). They say that every time a serious epidemic fell on Vojtylo, the monk Alexius appeared in the sky with a candle in his hand and he was expelling the plague. The church (rather a chapel) is reached by a whitewashed stone staircase which leads to a tiny court with beautiful views over the bay. The church itself is built in a natural cave, the opening of which is built up leaving only 3 openings: the entrance and two small windows. The entrance to the church has a niche above it, in which a fresco of Virgin Mary survives. The two windows, positioned both on the right side of the entrance, are used to let the day light into the church. There is a small bell hanging by the entrance. The church is very small but it has impressive frescos which cover almost all of its walls. The stairs leading to the little church of Raselianiko Monastery. 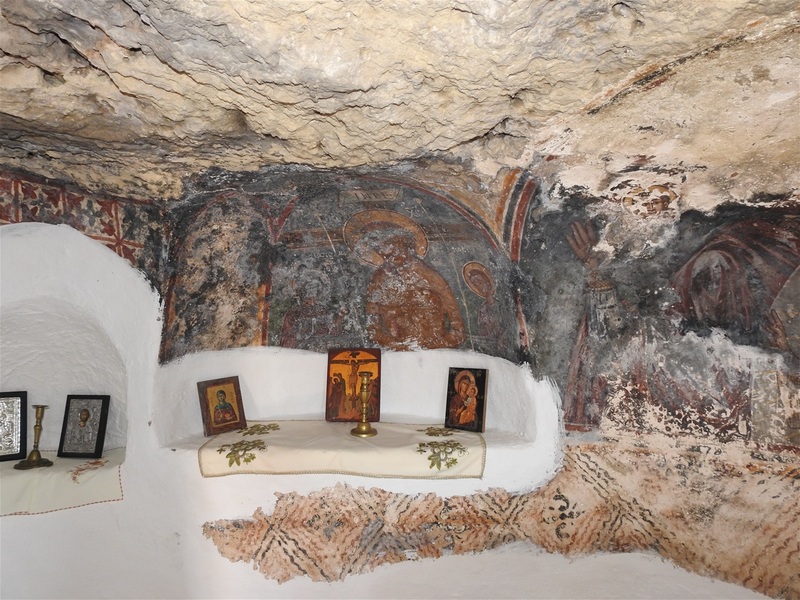 The interior of the Panagitsa chapel. Even though the church is well hidden and cannot be seen from anywhere, it is not difficult to be reached. On the side of the road leading to Oitylo, they have recently erected a stone inscription (resembling a menhir), which cannot be missed. By this “monument” there is a path going down. Follow this path for about 100m and at some point, you will see the whitewashed stairs of the church. The time I visited, the door of the church was unlocked, so I managed to admire the interior. 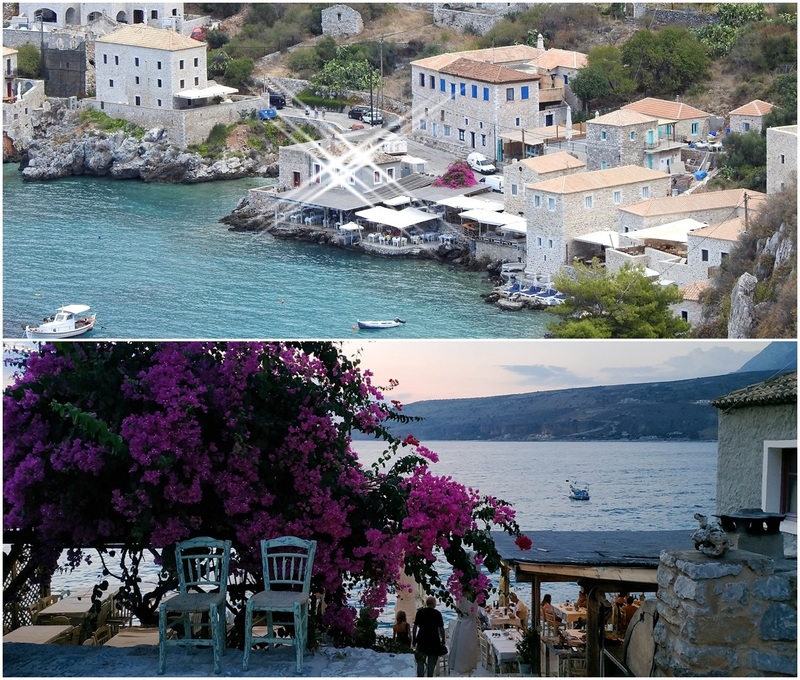 The most beautiful village in the whole Mani, is located here and is called Limeni (Λιμένι). Limeni has served as the Areopolis haven. 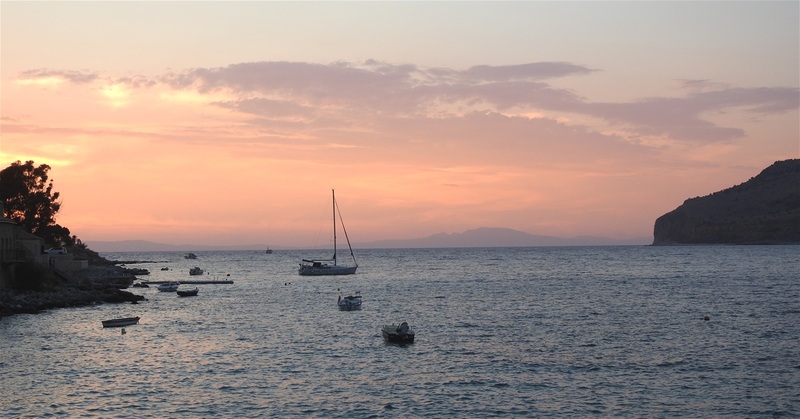 Limeni with its stone houses, its crystal-clear waters and beautiful sunsets stole my heart. The village is just a strip of land restricted by the sea and the mountains behind it. Strolling at the only road of the village you see imposing stone houses and among them glimpses of the sea. The taverns and the guest houses almost touch the sea, savoring its saltines. 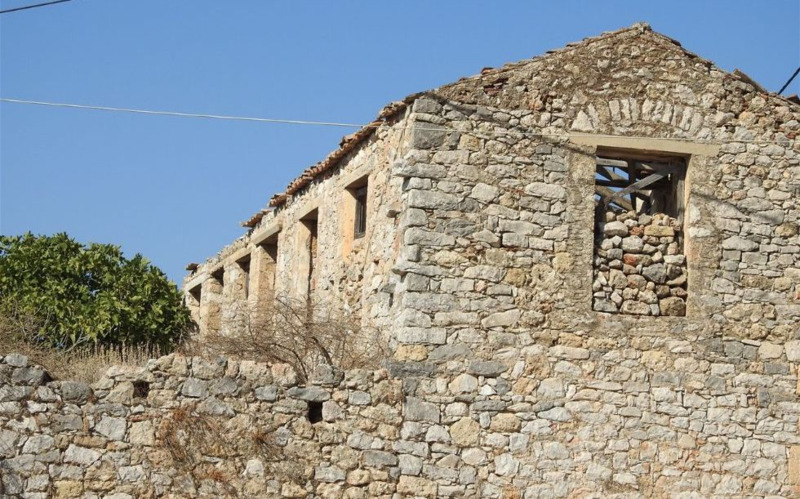 Among the houses of Limeni, there are two of an historic importance. The “Mavromichali Tower” (“Mavromichalai Palace”) has been built during the middle of the 18th century (1762) from Pieros Mavromichalis (father of Petrobey) and was officially the first residence of Petrobey Mavromichalis, warlord of Mani and leader of the Hellenic war of independence against the ottoman Turks. The palace complex consists of a large oblong house and a four-storey tower on its southern side. The stone residence, just opposite the “Mavromichalai Palace”, constructed not much longer after the palace did, is also referred to as “Sissition” (mess hall), since it was provided from Petrobey to his arm-chiefs as a place of resting and messing. Inside the residence Petrobey ancestors lived until the middle of the 20th century, when it was abandoned, which resulted to its isolation and eventual collapse. The Hellenic Ministry of Culture, by law, has proclaimed the palace as a unique historic preserved building and restored it to become a museum. The "Sissitio", which is located on the rocky shore, has also been fully restored to its original glory and today operates as a luxurious guest house. Limeni in the dusk. "Mavromichalai" Tower seen on the right. 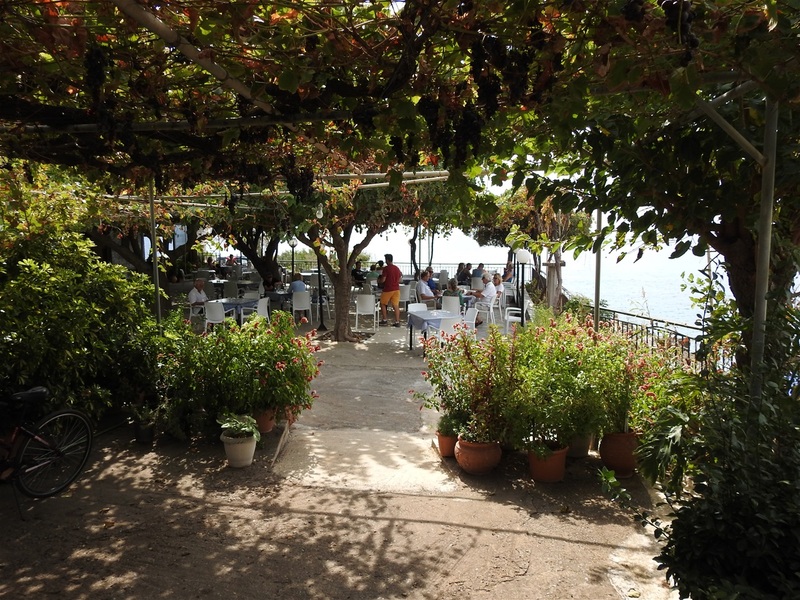 Most of the sites about eating in Limeni recommend the “Takis” fish tavern ("Ο Τάκης"). It is recommended especially for its fresh fish and other seafood bites. 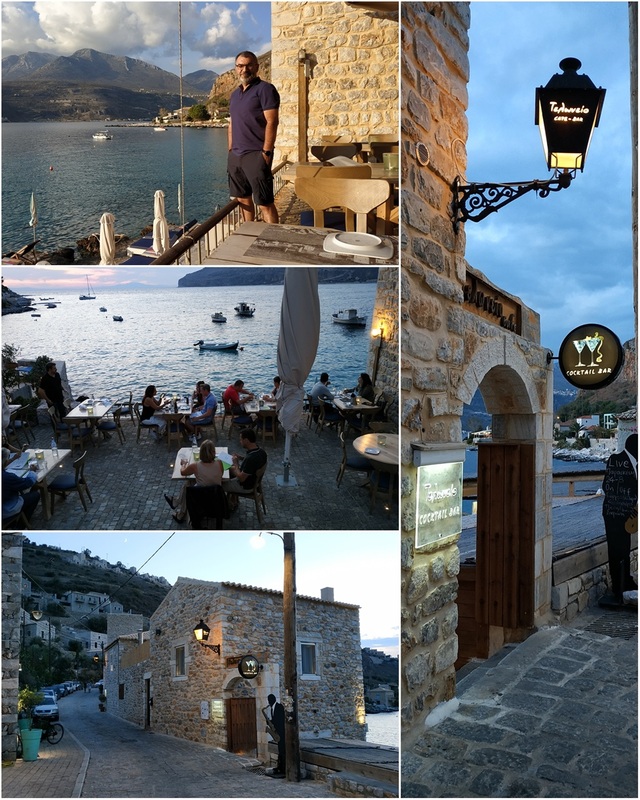 The tavern is located on the rocky shore and really looks very beautiful, but I did not visit it, as it happened to discover the only restaurant I really recommend and have visited the 3 out of 4 nights I was in the area. The fourth night I just did not feel like leaving the hotel room, as I was exhausted having walked all the way to Cape Tenaro that day. Housed in two-storey old buildings, Teloneio is consisted of two terraces separated by the main building. On the first terrace, the big one which is extended on two levels, is the restaurant; and on the other terrace is located the cocktail-bar, the lounge. The lounge has white leather sofas where you can enjoy a light meal (pizza, club sandwich, etc.) or ice-cream, drinks, refreshments and desserts. The restaurant serves excellent food in generous portions. This is not a cheap restaurant, but we all deserve have a beautiful meal from time to time. The best option is to choose from the appetizers list: plates here are of good value. 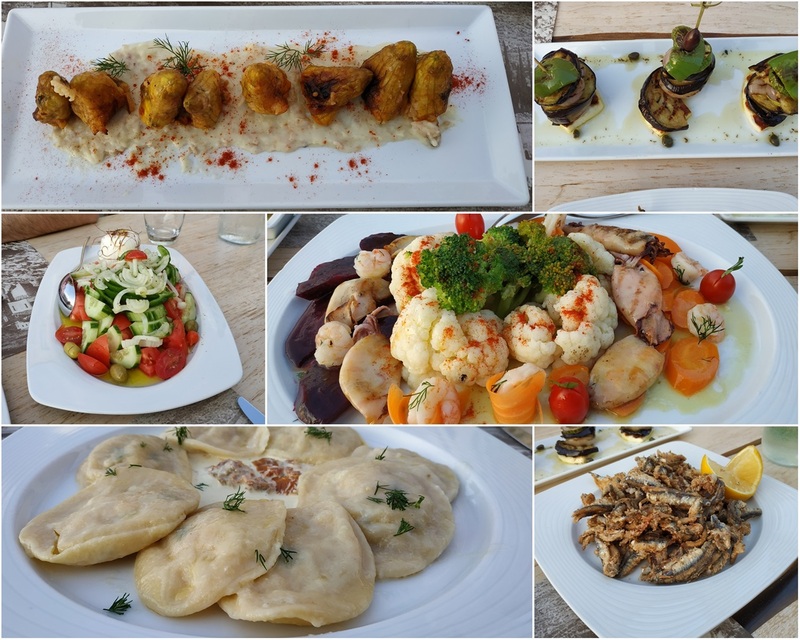 From the appetizers I tasted the grilled vegetables mille-feuille (with talagani cheese, capers & extra virgin olive oil) and from the salads the yummy Sea salad (with broccoli, cauliflower, carrot slices, shrimps marinated with ouzo, grilled squid & extra virgin olive oil dressing). From the main dishes I tasted the most crunch and tasty fried filleted anchovies I ever had and homemade ravioli with fresh shrimps. And yes, there is a dessert menu, too. My best? Crème brûlée with pistachios. Both terraces have unrivalled views of the bay. Nothing better than having a romantic dinner here. Mille-feuille and Crème brûlée with pistachios. Oitylo bay. Seen from "Teloneio" lounge bar. 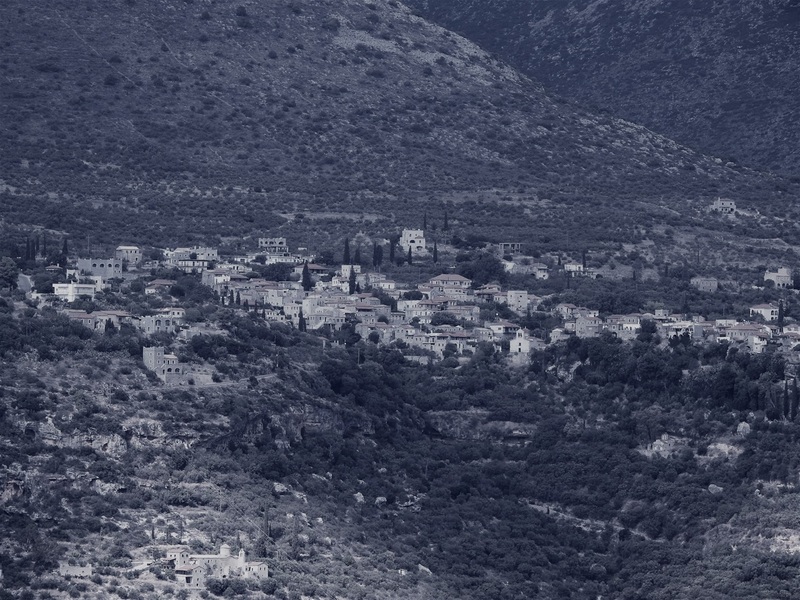 Areopoli (Αρεόπολη), known before 1912 as Tsimova (Τσίμοβα - a Slavic word that means “city of the devil” or “small plain”), is the capital town of Mani. The word Areopoli means "city of Ares", the ancient Greek god of war. 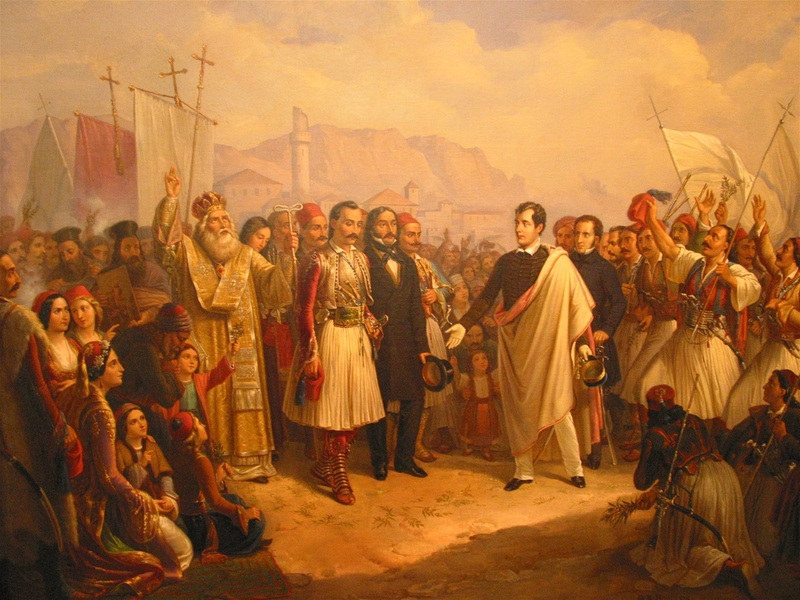 The Greek War of Independence was started at Areopoli on March 17, 1821. 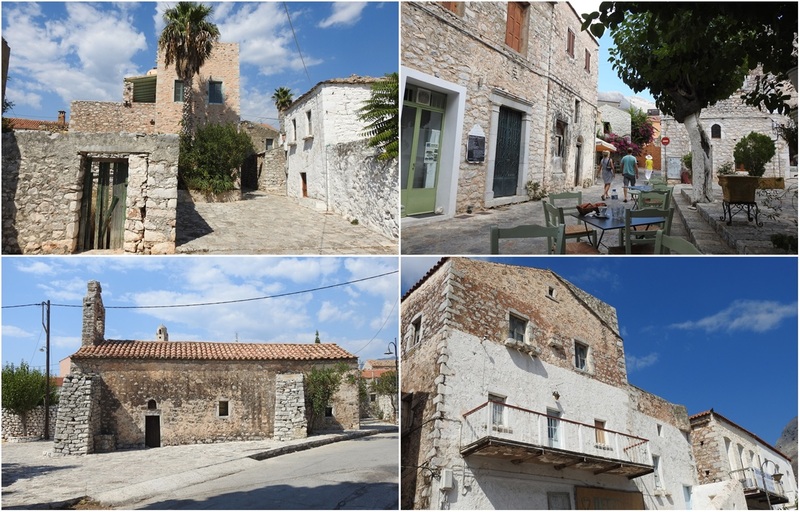 Today Areopoli has grown into a flourishing town with lots of hotels and restaurants. Tourists stroll in the narrow streets of the old town admiring the stone tower-houses and churches. Kapetan Matapa street in Areopoli. The three squares of central Areopoli. Athanaton Square (top), Kapetan Matapa Square (middle) and 17th of March 1821 Square (bottom). The main street of the town, Kapetan Matapa Street, runs through the town and connects three squares: Athanaton Square, Kapetan Matapa Square and 17th of March 1821 Square. The churches of Agios Athanasios, Virgin Mary (& Agios Charalambos) and Agioi Taxiarches stand on each of the three squares respectively. Vehicle traffic is prohibited on Kapetan Matapa Street, which is full of nice cafés, bars and restaurants. Agioi Taxiarches or Taxiarchis, the metropolis of Areopolis, has an important sculptured iconostasis and an exceptional stone-carved decoration. The impressive multilevel bell tower of 1836 can see from everywhere in the city. Its 18th-century dome externally is decorated with reliefs of the zodiac. Of particular interest are stone lintels of the gate sculpted in 1798. The lintel reliefs above churches’ entrance date back to 1798 and depict the archangel (Taxiarches) Gabriel and Michael. Here in this church, on March 17, 1821 the Maniats, headed by Petrombei Mavromichalis, the last bey of Mani, gathered for the mass and after that, in front of the Church, they raised the banner of the revolution, known as the “Flag of Mani”. The metropolis of Areopolis: Agioi Taxiarches. The flag was white, with a blue cross in the middle. Above the cross the words «Νίκη ή Θάνατος» (Victory or Death) is written and bellow it the words “Ταν ή επί τας». 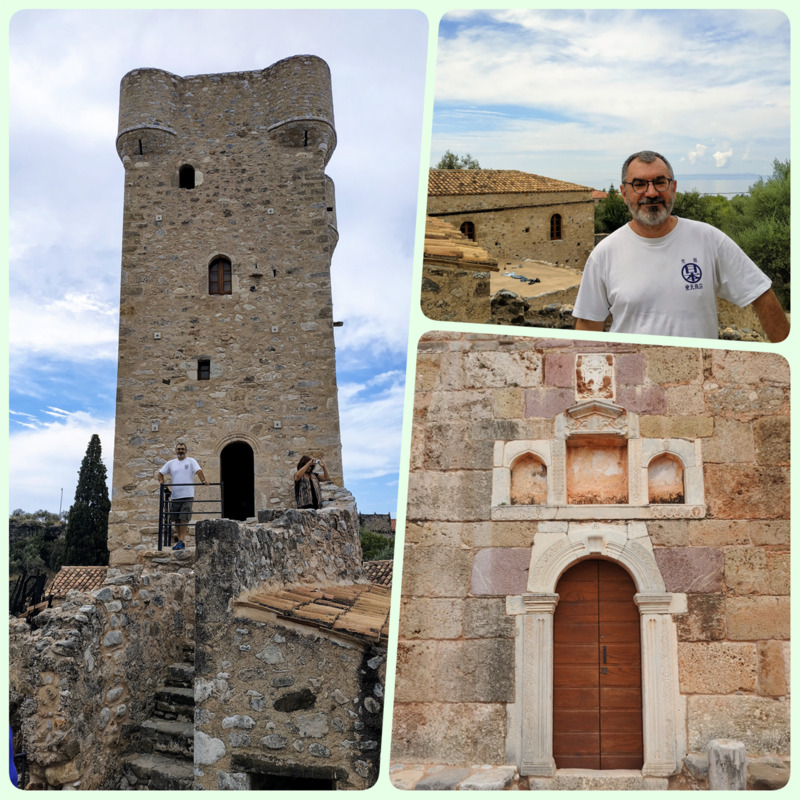 Not far away from the main street (next to the church of Agios Ioannis) stands the Byzantine Museum of Mani, which is housed in Pikoulakis Tower. 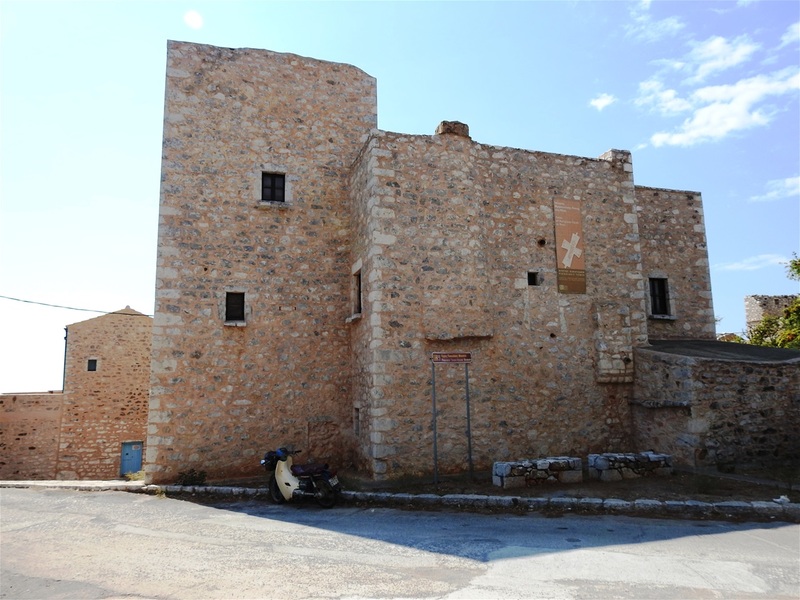 The complex is a fortified mansion with a tower and a tower house, built in the pre-revolutionary years, donated by Ioannis Pikoulakis to the State. The Byzantine Museum of Mani is housed in Pikoulakis Tower. The towerhouse of Stylianos Mavromichalis. The museum’s permanent exhibition deals with the "Stories of religious faith in Mani". Not far from the Pikoulakis Tower stands the towerhouse of Stylianos Mavromichalis, a great example of fortified tower. Continue the road passing by the tower and at the small square, some meters to the north, you will see a small chapel. The frescos (what has been left of them) inside the chapel are beautiful. The little chapel close to the towerhouse of Stylianos Mavromichalis. 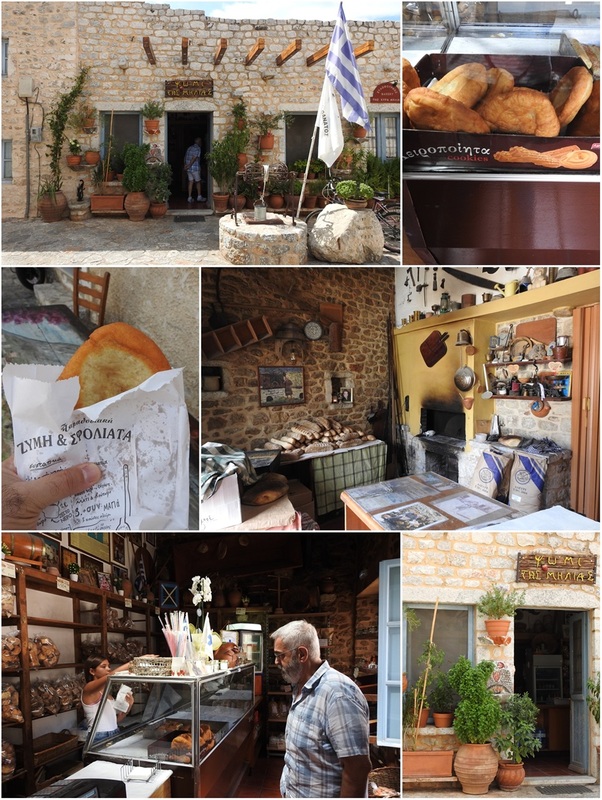 There is no site or book about Areopoli which does not prompt you to visit the bakery “Mrs Milia Bakery” (Φούρνος «Της κυρά Μηλιάς»). It is supposed to be one of the oldest or maybe the oldest bakery in Greece. At one side of the historical square of “17th March” there is a stone well and just behind it is located this traditional oven. Milia Tsatsoulis married a Maniot who died at the age of 29 and with whom she had 6 children. Since then she has dedicated herself to the wood-burning oven of her mother-in-law and her children. In 2012, its multigrain bread was awarded as the best bread of Greece. Every morning from the oven comes out freshly baked bread, cookies, pies and “travichtes” (τραβιχτές). Travichtes are made of salted dough, shaped like flat gondolas and fried into olive oil. This traditional maniot bread is served with cheese or ham or can be eaten alone as a street snack. The traditional Bakery of Areopolis “The oven of Mrs. Milia”, and its traditional "travichtes". 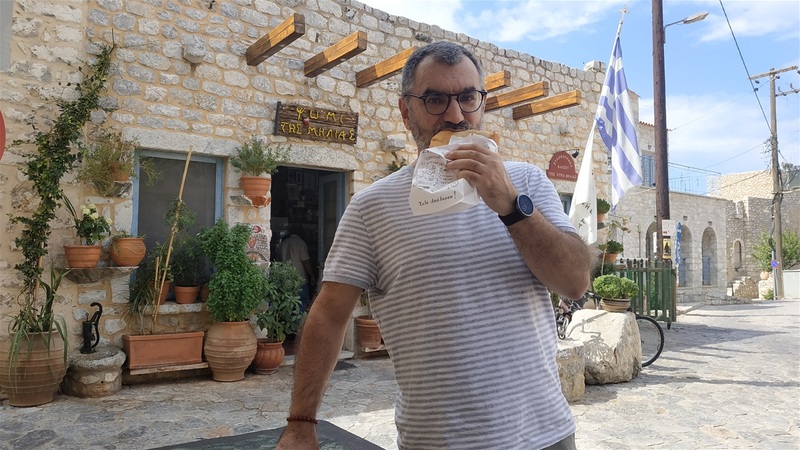 Me eating a delicious travychti from Milia's bakery. From Oitylo to Kardamyli (red line). Courtesy of Google Maps. The town layout (top left). Kardamyli (Καρδαμύλη) is another important city in western Mani and the only one that can compete Areopoli in importance, size and beauty. The two cities are connected by a beautiful, 40km long coastal road. It takes just over an hour to arrive in Kardamyli from Areopoli, but do not rush. Try to enjoy the magnificent landscape of deep blue waters, bare, rocky mountains, olive orchards and small villages with stone houses and churches. Kardamyli is built by the sea, by the estuaries of a stream which forms the deep Viros Gorge, at the foot of Mount Taygetus. 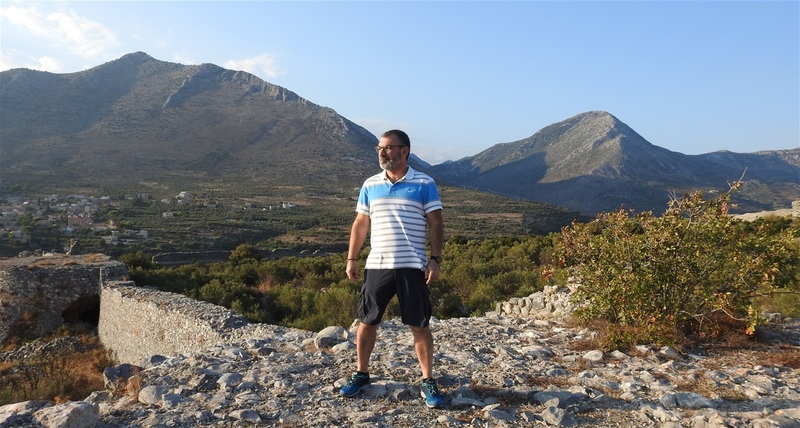 Kardamyli is known for having an especially good view of Mount Taygetus, known locally as the "Profitis Ilias" ("Prophet Elias"). The town is located very close to Kalamata and is a very famous weekend destination for the people of the city. The modern Kardamyli looks very tidy with its 19th century buildings the beautiful craft shops, cafés and restaurants. The town began to prosper about a hundred years ago, thriving on its local production of olive oil, the economy generated from a small soap factory, and the hustle of its small harbor. Its population reached a peak at the beginning of the 1920s, but the mid-20th century witnessed a large exodus when many villagers migrated to Athens, the North Americas and Australia. Those who remained made a living from olive farming, but those who never lost their love for the area eventually returned and to open tourist businesses. The port of Kardamyli with its old customs house (under renovation). 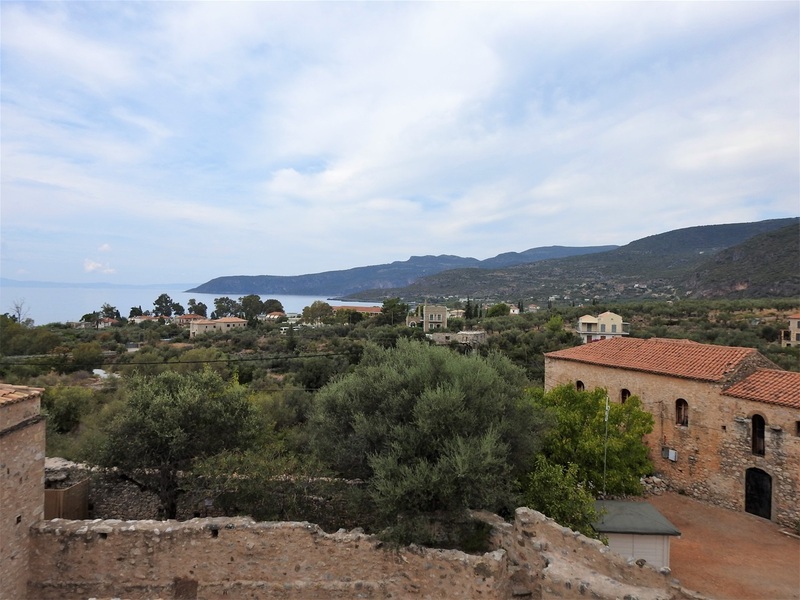 Kardamyli is one of the oldest settlements in the Peloponnese, with its current name being mentioned in the Iliad, the epic poem by ancient Greek writer Homer. In the Iliad, Homer cites Kardamyli as one of the seven cities offered by Agamemnon to Achilles as a condition to rejoin the fight during the Trojan War. Many of the townspeople can trace their lineage back to either famed clans of the area (e.g. Mourtzinos and Troupakis clans), or the Byzantine Emperor Constantine Palaiologos, one of whose descendants (Dimitri Palaiologos) settled in the region. The descendants of Dimitris Palaiologos today typically bear "Dimitreas" as their family name. The main attraction of the city is the “Old Kardamyli”, nestled on a gentle slope just behind the main street of the modern town. This is the medieval part of the town which includes a castle and outworks and the imposing 18th century church of Saint Spyridon. Many of the buildings of Old Kardamyli, also known as "Pano Kardamyli", or "Upper Kardamyli", or “Skardamoula” were built by the Venetians and feature a mix of traditional Greek and Venetian design. How to reach "Old Kardamyli". Either on foot or car till the parking lot (P)(red line), and after that on foot (yellow line). 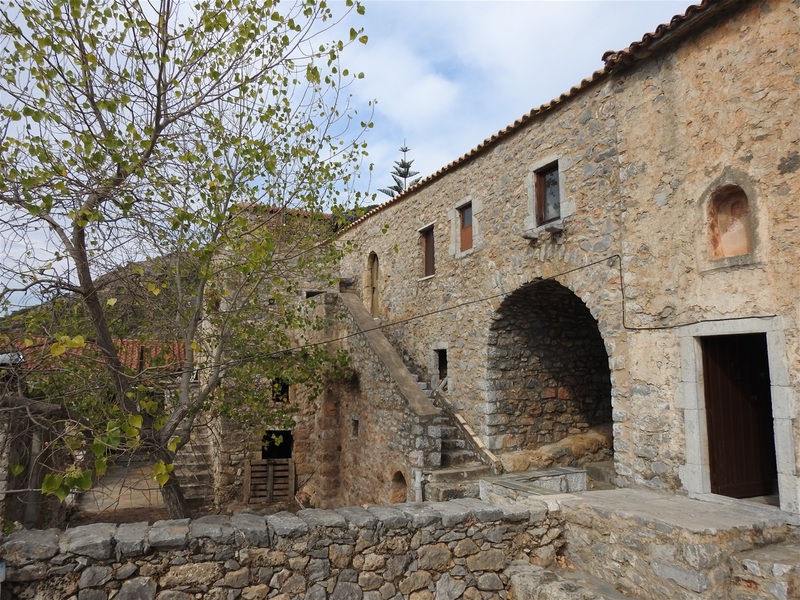 During the 19th century, Kardamili was the stronghold of the Troupakis-Mourtzinos clan, arch rivals of the Mavromihalis clan from Limeni, both of which played very important roles in the Greek Revolution of 1821. 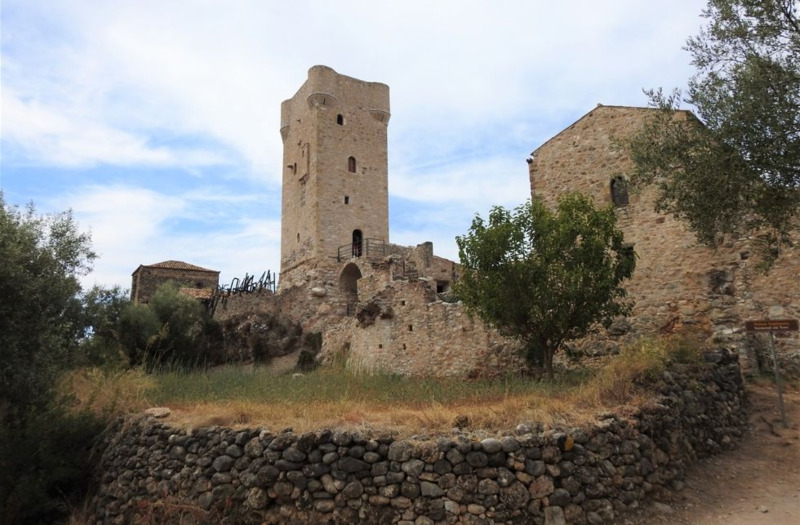 The fortified tower-houses are well-preserved and the Tower of Mourtzinos (Mourtzinos was the Troupakis family nickname) has been recently renovated. Old Kardamili can today be reached on foot: follow the main road towards Kalamata (north), at the end of the village (before the bridge over the stream) turn right, follow the sigh and then the path that leads up to the main gateway. If you drive, leave the car some 200m after the turn and then walk to the gate. The first building you see is the chapel of Agios Theodoros (Saint Theodore) and a couple of fortified houses which function as a hotel. The entrance to the restored part of "Old Kardamyli". You have to walk further around the hill, overpass the byzantine spring on your right hand and then you will see the main Gate. Just after the Gate you see the 18th century church of Agios Spiridon, whose slender 17 metre-tall belltower bears ornamental designs depicting the sun and moon, the stars, concentric circles and a double eagle. Unfortunately, you cannot visit the inside of the church, because as we were told the priest of the church is the only one having a key, and obviously he doesn’t want visitors to admire the beauty of its interior. The fortified enclave has been recently converted into a museum with modern installations. There is an admission ticket of 2€ to enter the complex/museum. The views from the top of the tower (Mourtzinos Tower) are amazing. 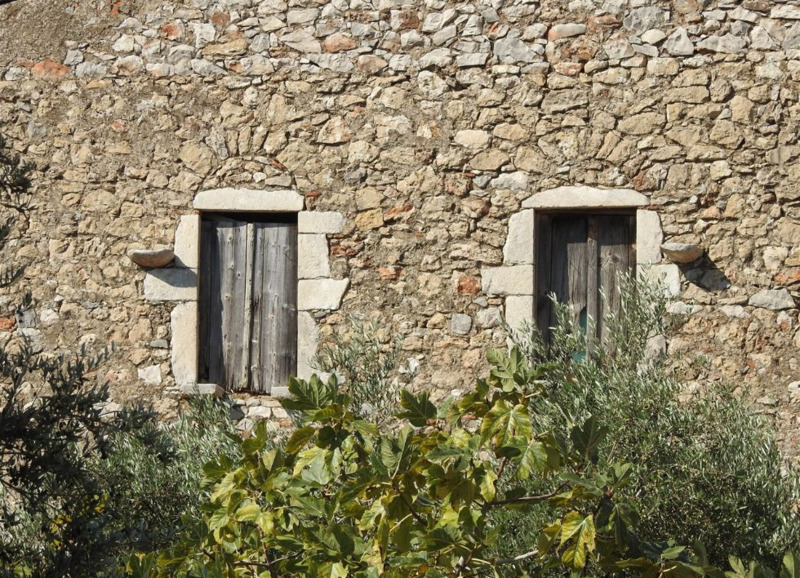 As you walk back down towards modern Kardamili, you pass through enchanting olive groves and fruit orchards and see the last tower-houses that now belong to the descendants of the Troupakis-Mourtzinos patriarchs: the Dimitreas, Petreas and Theodoreas families. THe view from Mourtzinos Tower towards the sea. 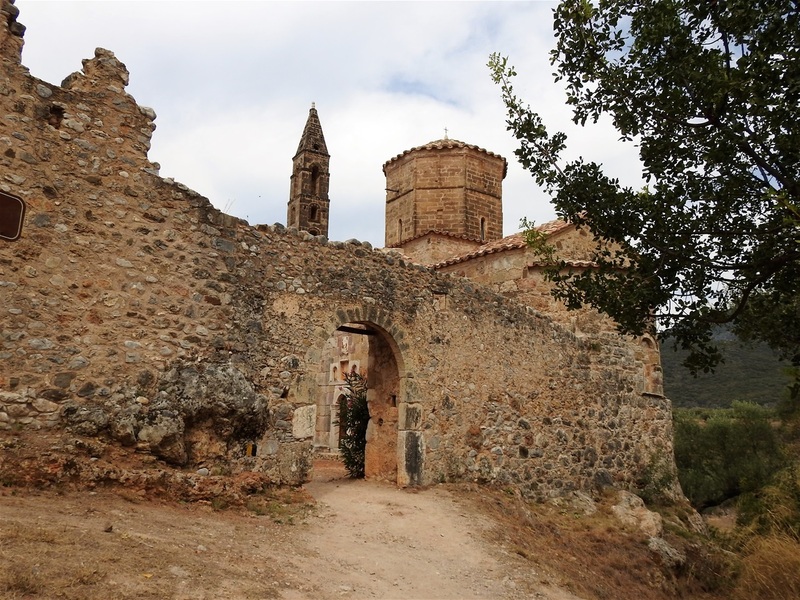 Mourtzinos Tower (left) and the entrance to the church of Agios Spyridon. The village of Kalamitsi, just outside Kardamyli was, in his later years, the principal home of Patrick Leigh Fermor and his wife Joan. Patrick was a British author, scholar, soldier and polyglot who was made an honorary citizen of the village for his participation in the Greek Resistance during World War II, especially in Crete. He was widely regarded as Britain's greatest living travel writer during his lifetime, based on books such as A Time of Gifts (1977). A BBC journalist once described him as "a cross between Indiana Jones, James Bond and Graham Greene". 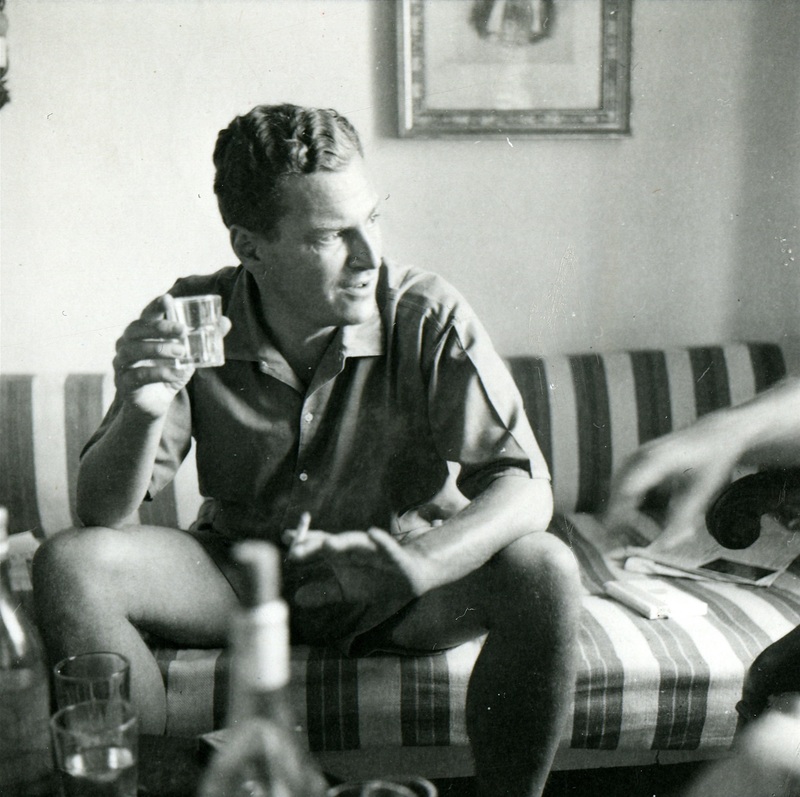 Patrick Leigh Fermor in his travel book "Travels in the Southern Peloponnese", published in 1958, covers his journey with wife Joan and friend Xan Fielding around Mani. The Fermors, left their house at Kalamitsi to Benaki Museum, which is the full owner today. According to the expressed desire of the Fermors and the donation contract, the house can be used to host intellectuals and scholars (writers, researchers, artists, poets, etc) who are looking for a quiet and hospitable place to work. 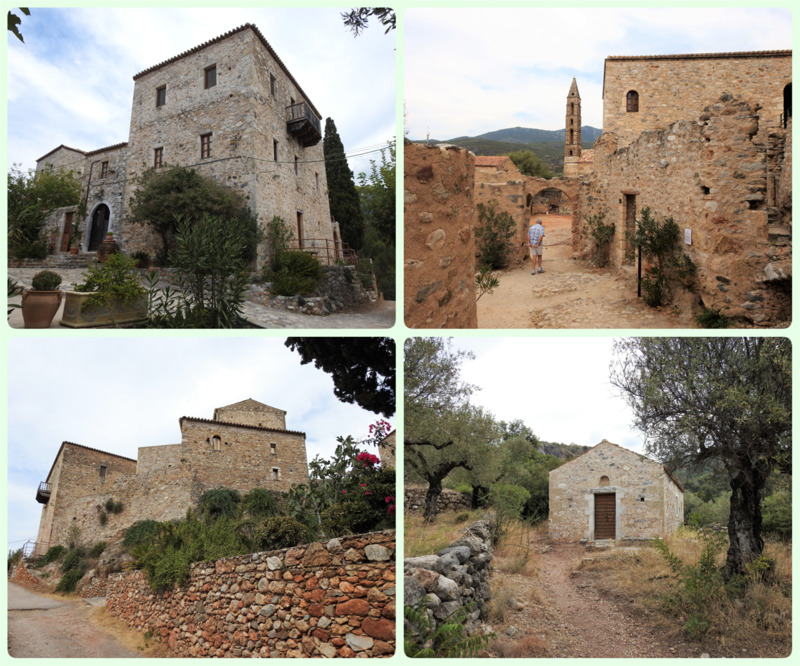 The Patrick and Joan Leigh Fermor House is not open to the public, as the repair works are under way. It will open with scheduled visits and guided tours in the summer of 2019. The house was featured in the 2013 film "Before Midnight". Take the way back to Oitylo. South of Karadamyli there are many beautiful beaches. Stoupa and Kalogria beaches, both located at Stoupa village, are two of the most famous beaches in the area and very popular for the holidaymakers from Kalamata. 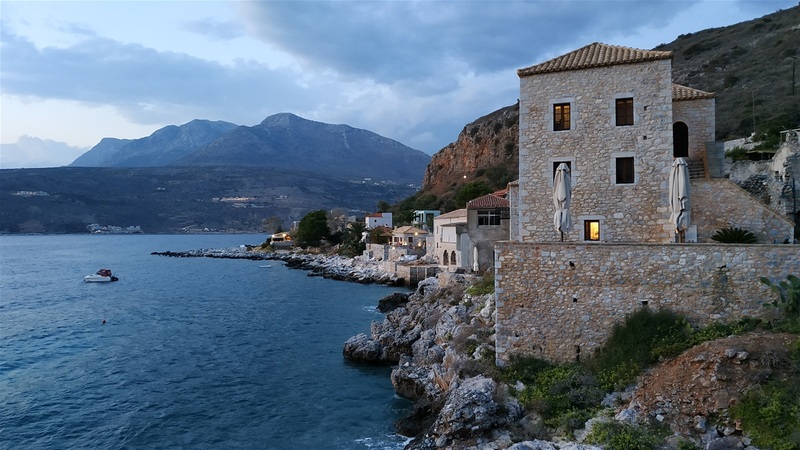 The village of Stoupa is not one of those picturesque places you may have in mind when you dayream about Mani, but it is famous for its nightlife. 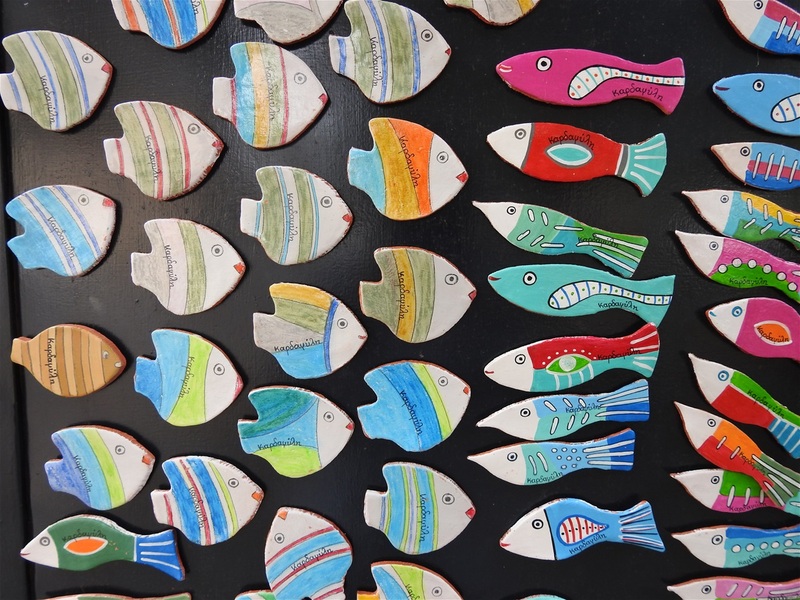 On the other hand, Agios Nikolaos village, some kilometers to the south, is a very beautiful settlement with several fish taverns around its harbor for the visitor to taste local food. The older name of the village was Selinitsa, meaning "little Moon" or "little Helen". According to the myth, Paris landed on the coast in the area (the locals believe that the landing site is where the small port of Agios Dimitrios is today) and grabbed the beautiful Helen (Helen of Troy). 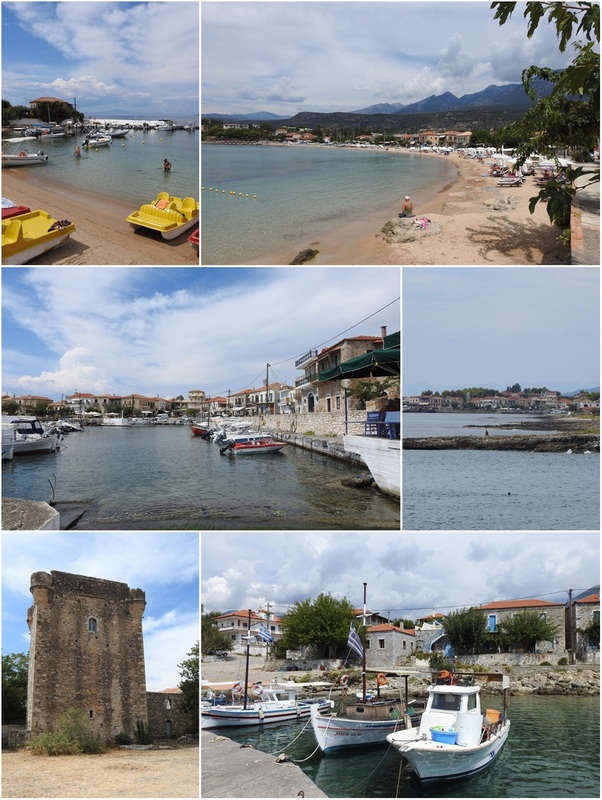 Stoupa beach (top pictures). 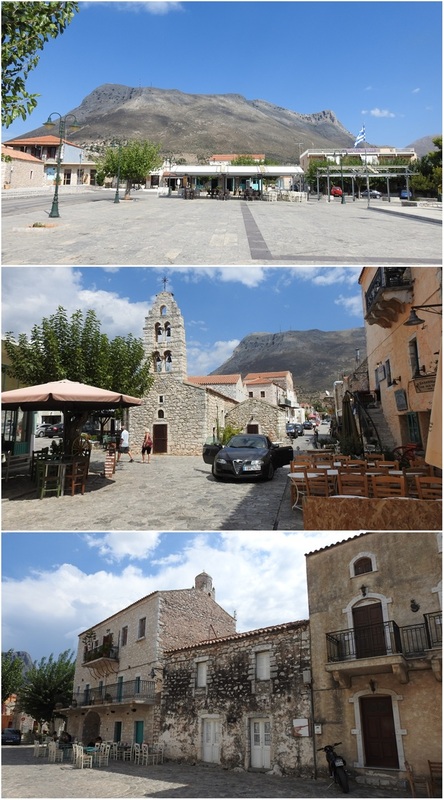 Agios Nikolaos village (middle pictures). 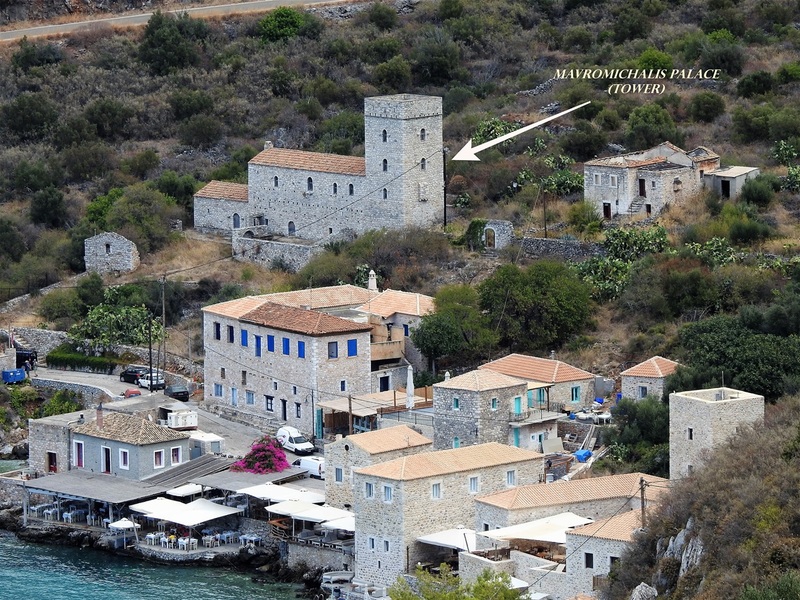 Agios Dimitrios: the towerhouse at the parking lot and the little fishing harbor (bottom pictures). The coastal road between Agios Nikolaos and Agios Dimitrios (yellow line). 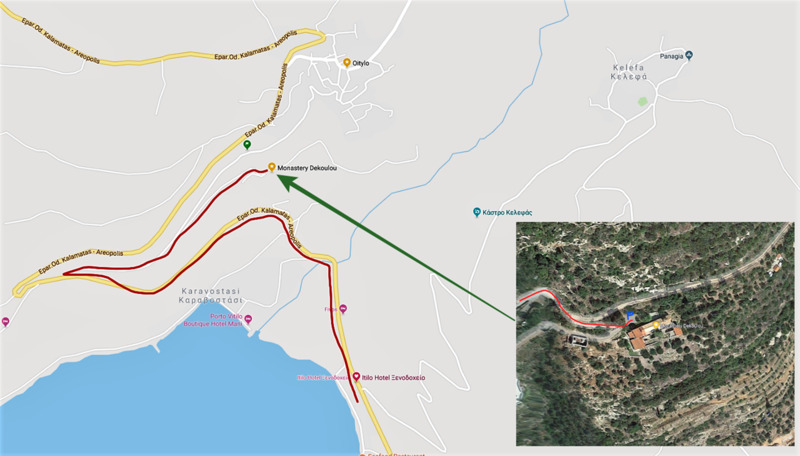 Red line shows the main road from Kardamyli to Areopoli. 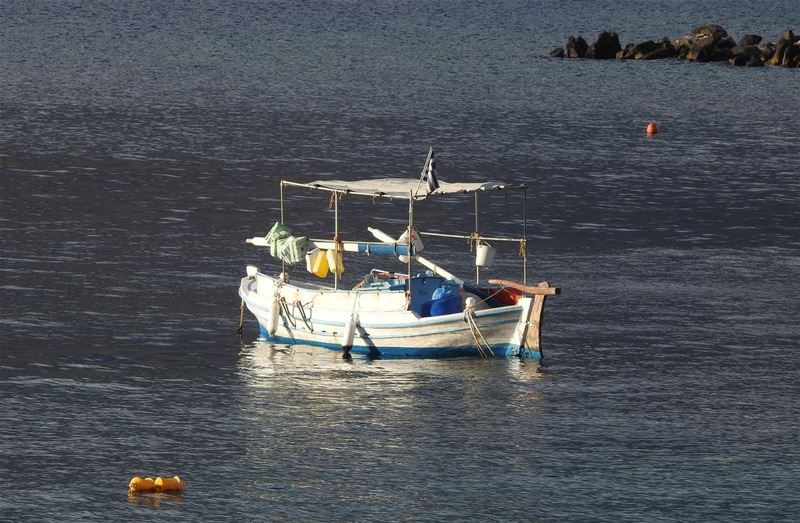 Agios Nikolaos in the ancient times was known as Pefnos. 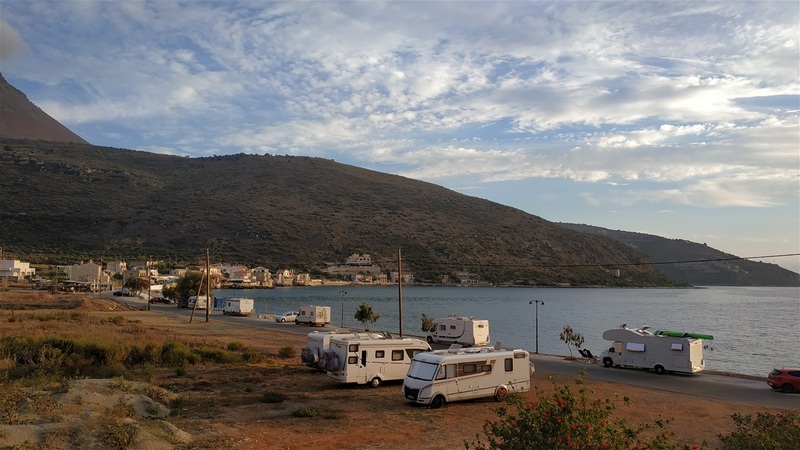 Opposite the neighboring village of Agios Dimitrios, there is the island of Pefnos, where, according to mythology, the Dioscouri twins were born. 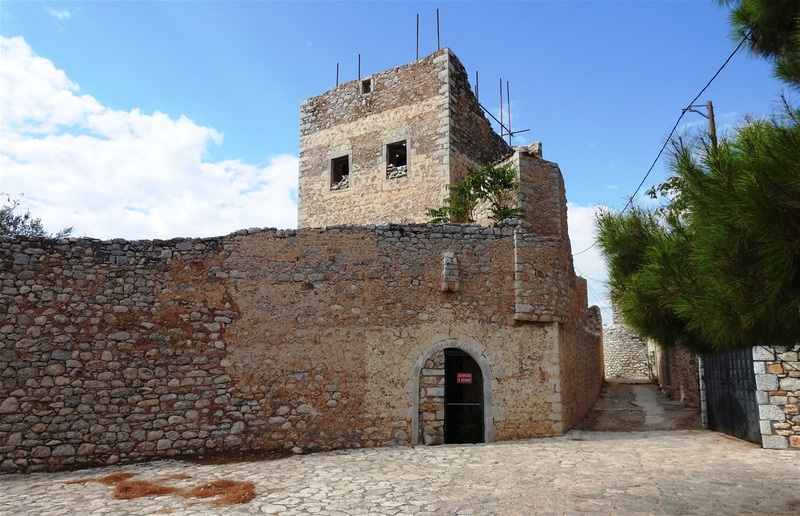 Near the little harbor of Agios Dimitrios, at the village parking lot stands a very well preserved towerhouse. Castor and Polydeuces (Pollux in Latin), were half-twin brothers in Greek and Roman mythology, known together as the Dioscuri. Their mother was Leda, but they had different fathers; Castor was the mortal son of Tyndareus, the king of Sparta, while Polydeuces was the divine son of Zeus, who seduced Leda in the guise of a swan. Because of this, it is said that they have been born from an egg, along with their twin sisters Helen of Troy and Clytemnestra who were born from a second egg. In Latin the twins are also known as the Gemini ("twins"). When Castor was killed, Polydeuces asked Zeus to let him share his own immortality with his twin to keep them together, and they were transformed into the constellation Gemini. The pair regarded as the patrons of sailors, to whom they appeared as St. Elmo's fire. They were also associated with horsemanship, due to the idea that they rode the 'white horses' of foam that were formed by curling ocean waves. 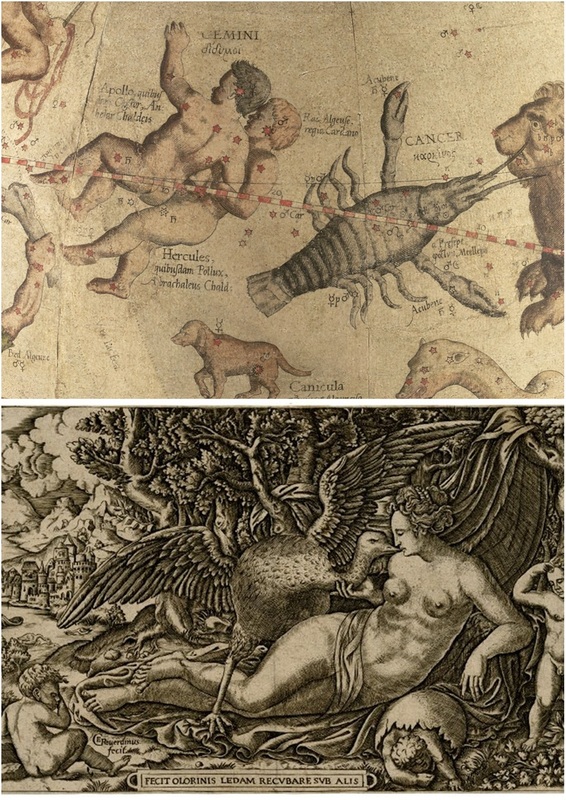 The constellation Gemini in an old sky map (top). Georges Reverdy engraving: Leda lying with Zeus-swan next to her. Two children have already been born with the third one emerging from the egg -London, British Museum (bottom). “Voulimeneas Café-Restaurant” is a must visit. On the coastal road between Agios Nikolaos and Agios Dimitrios,on a rock by the sea, there is an excellent restaurant, which I really recommend. You can enjoy traditional dishes in a tranquil courtyard covered by a shady arbor. This place really reminded me of past times. “Voulimeneas Café-Restaurant” is a must visit. I had the tastiest stifado ever (veal cooked with small onions into tomato sauce) and beans coocked with spinach. We also ordered (not me!) traditional Mani sausages. I really dislike the peculiar taste of maniot sausages: they are spiced with orange peel!!! There is also another traditional maniot product I dislike. It is called "sygklino" and it is smoked pork cured into orange juice and orange peel. 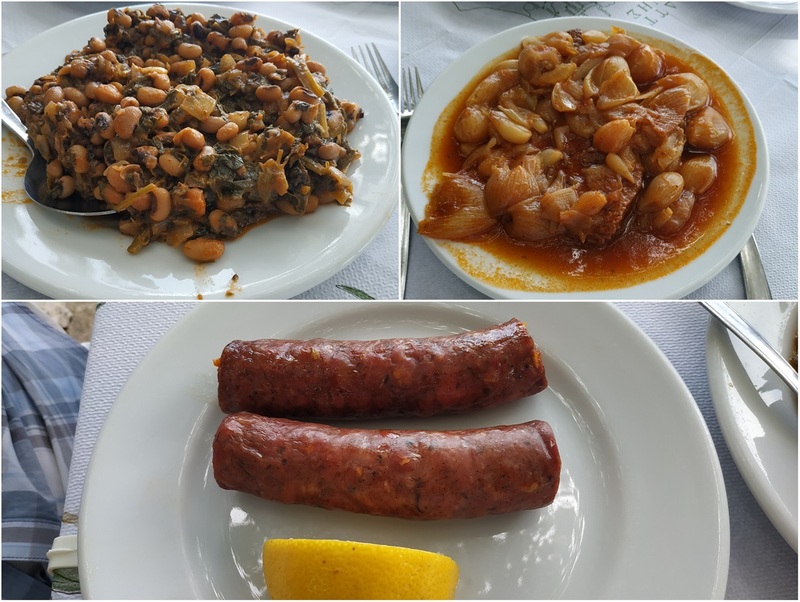 “Voulimeneas Café-Restaurant” dishes: beans with spinach, veal with onions in tomato sauce and maniot saucages (with spices and orange peel). The square of Platanos Village with the big plane tree. Back to the main road towards Oitylo and Areopoli, which passes through beautiful villages and stunning stone chapels and churches. Platsa has a beautiful main square and a bar-café closeby, which has a beautiful garden. Nomitsis, Thalames, Platanos and Lagkada are some more villages you can explore. On the main square of Platanos village there is a beautiful tavern-café with the same name: “Platanos” (literally "plane tree"). At the tavern you can enjoy local food or your coffee under a huge plane tree. 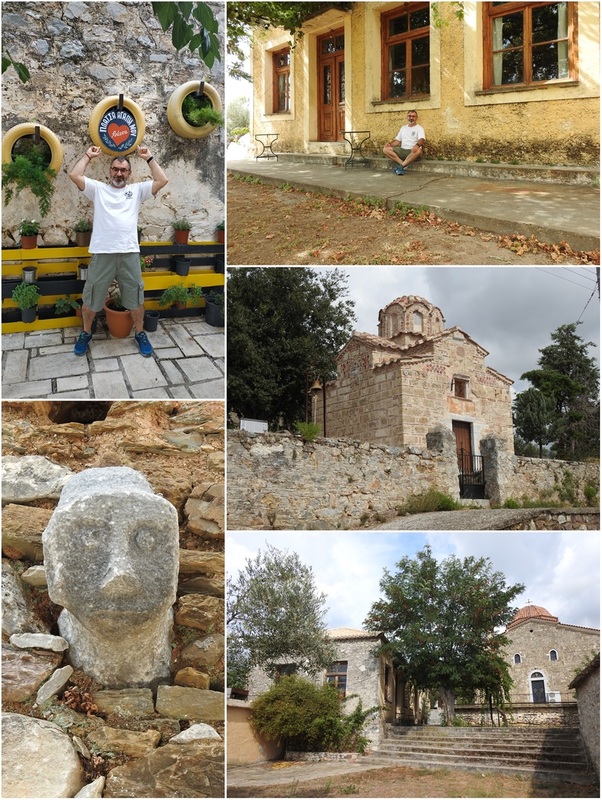 The villages between Kardamyli and Areopoli are beautiful little settlements with many stone churches and chapels..